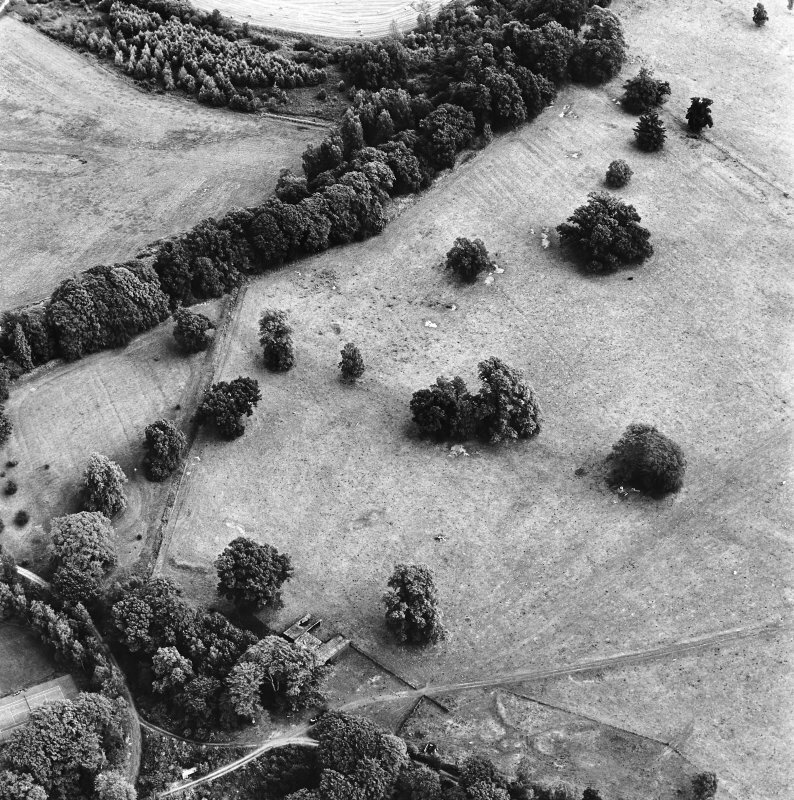 Oblique aerial view of the site of Delvine Golf Course and Inchtuthil, looking SE. 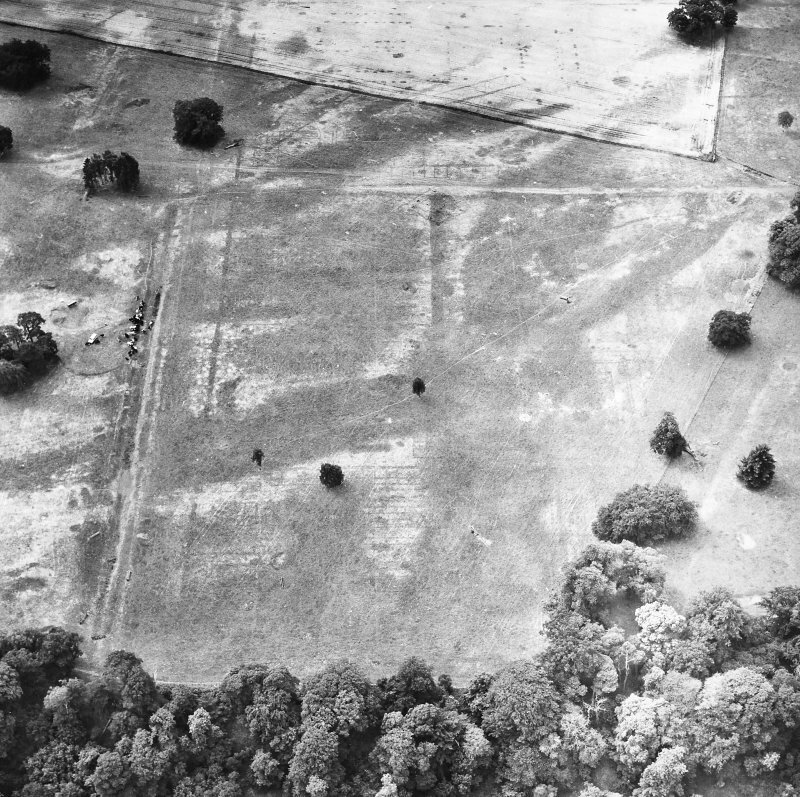 Publication plan (two leaves) drawn for reduction. 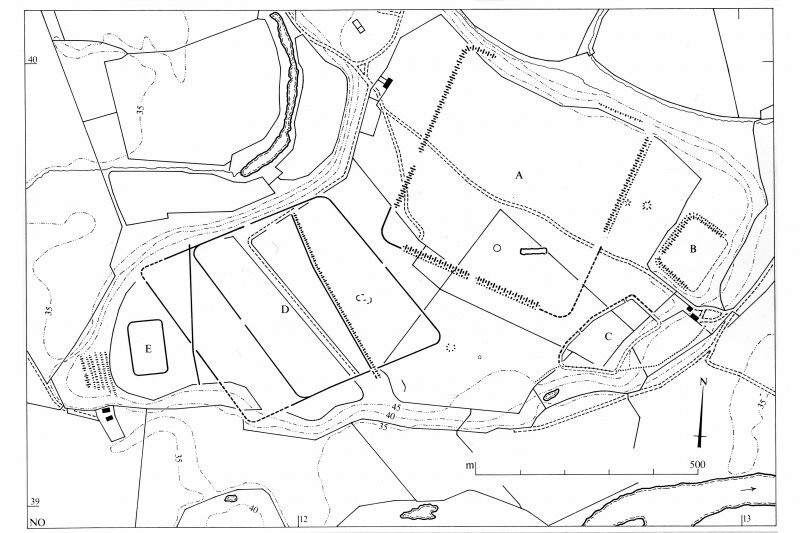 General plan of monuments on the plateau, indicating specific remains. 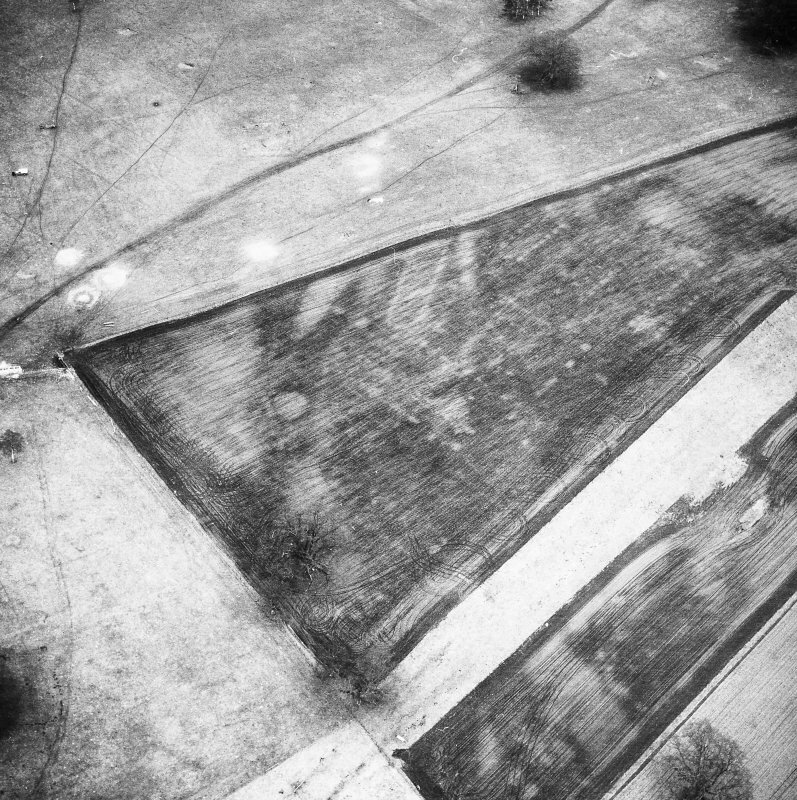 Inventory p. 78. 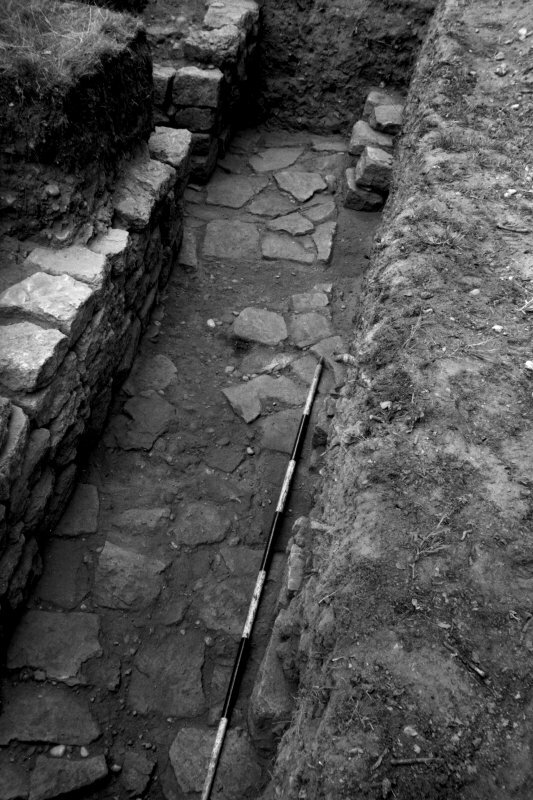 Excavation photograph showing the tyres and nails in pit 1 of fabrica. 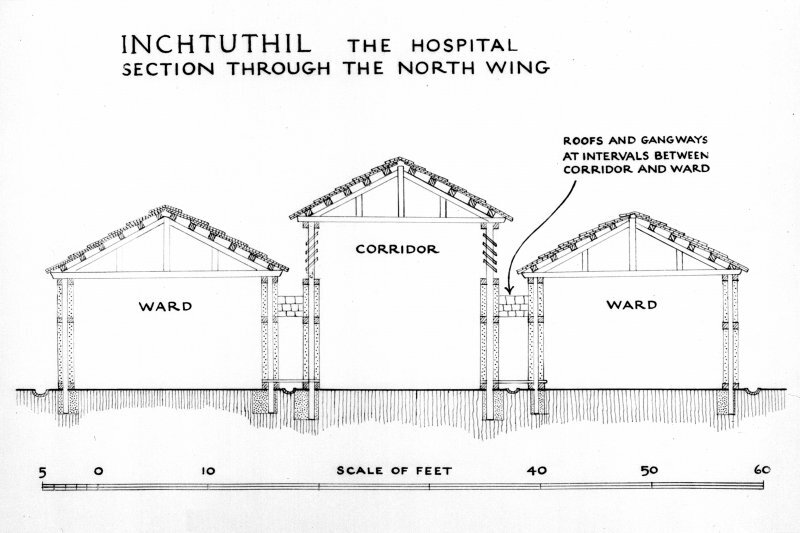 Photographic copy of a drawing showing a restored cross-section through the north wing of the hospital. 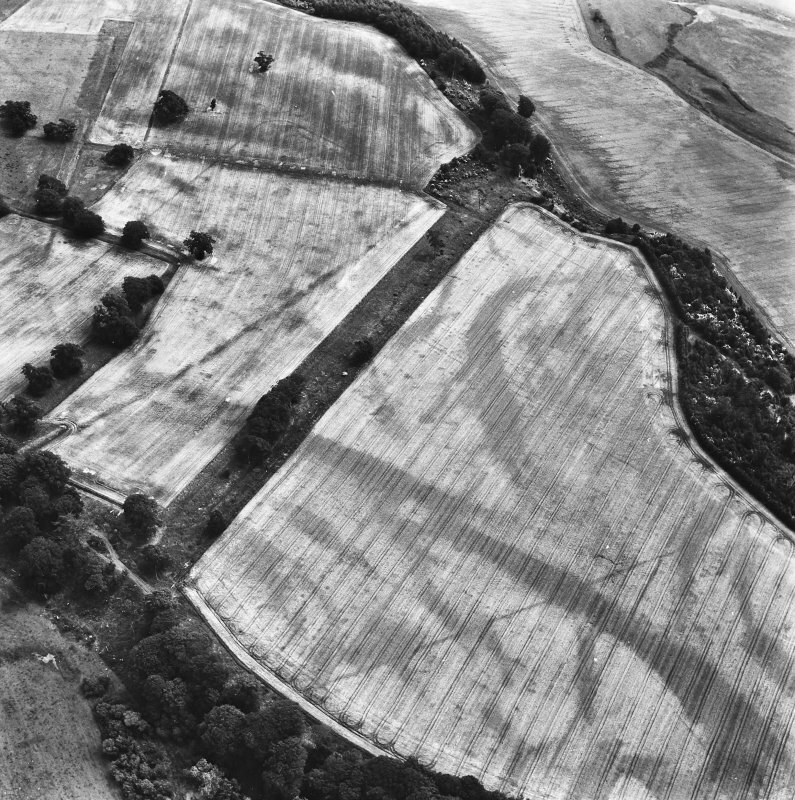 Inchtuthil publication fig 17, page 96. 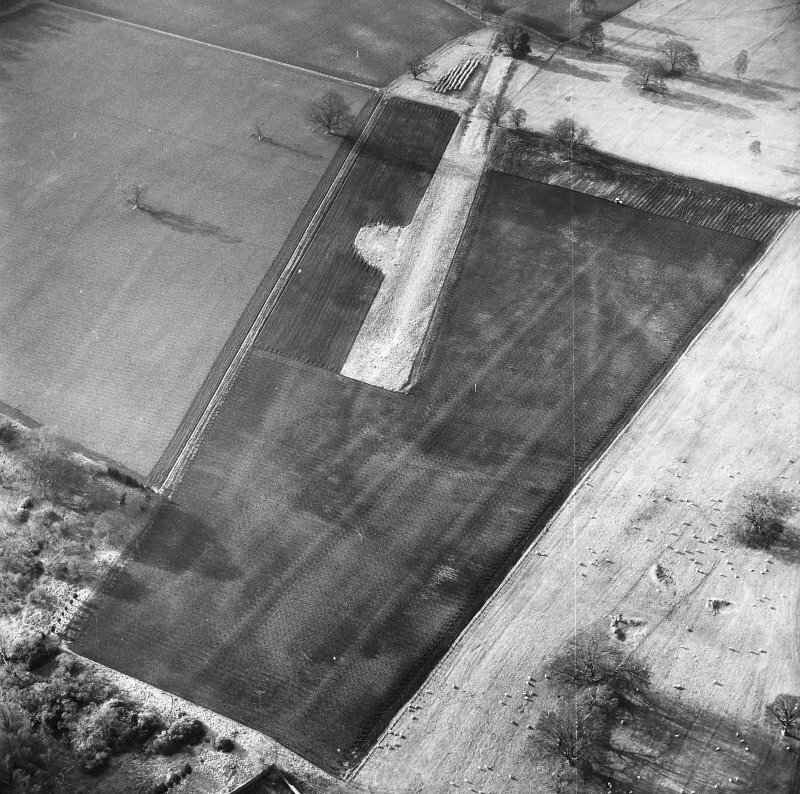 Excavation photograph showing the sewer junction in the barracks. 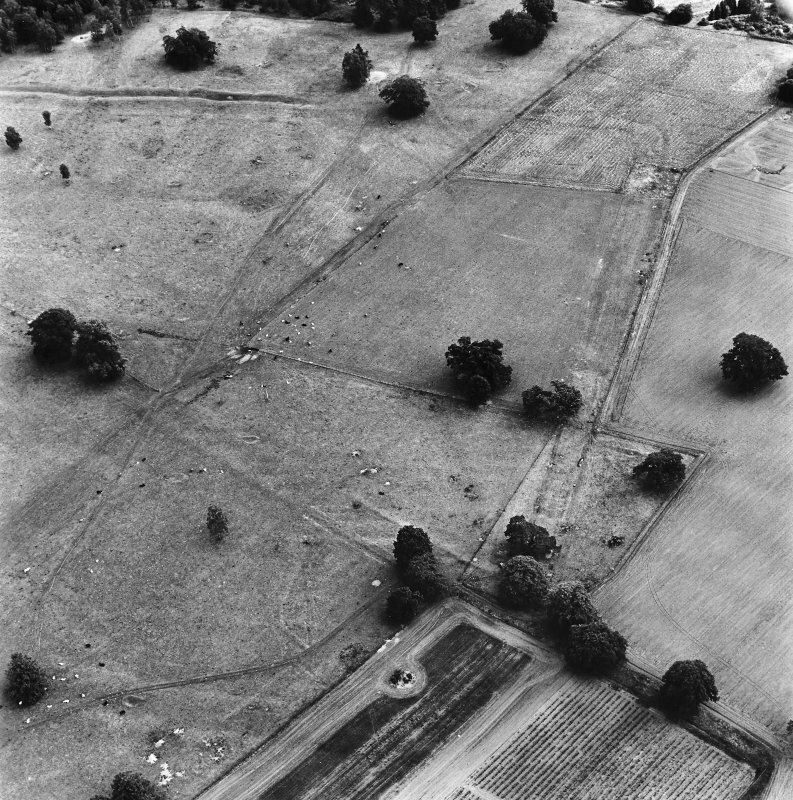 Excavation photograph showing the offices on the N side, the divisions and returns. 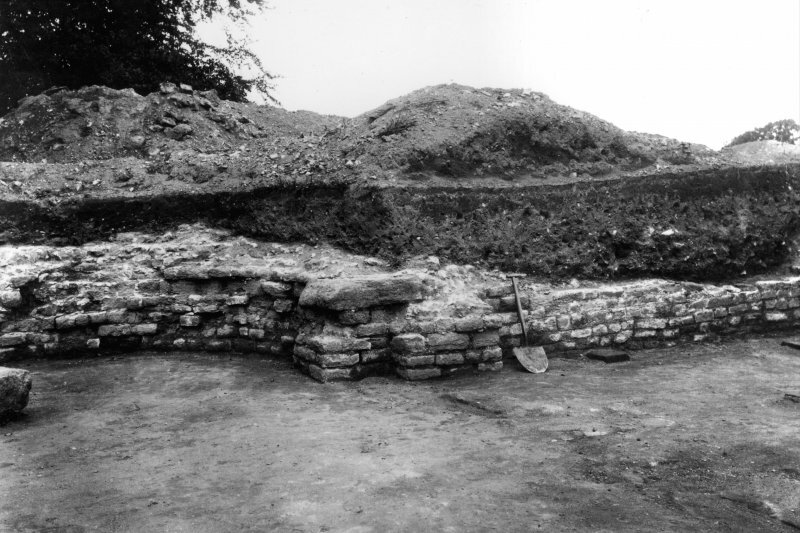 Excavation photograph showing the E wall of granary II. 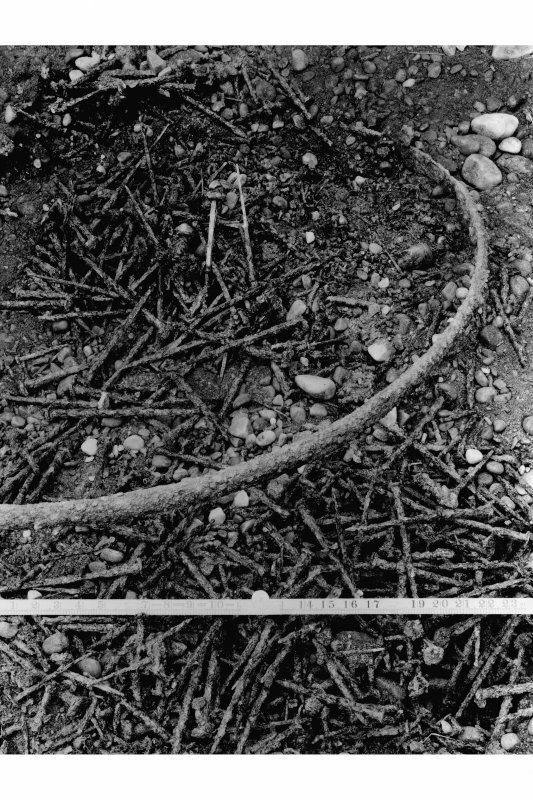 Excavation photograph showing tyres and nails in (fabrica) pit 1, detail view. 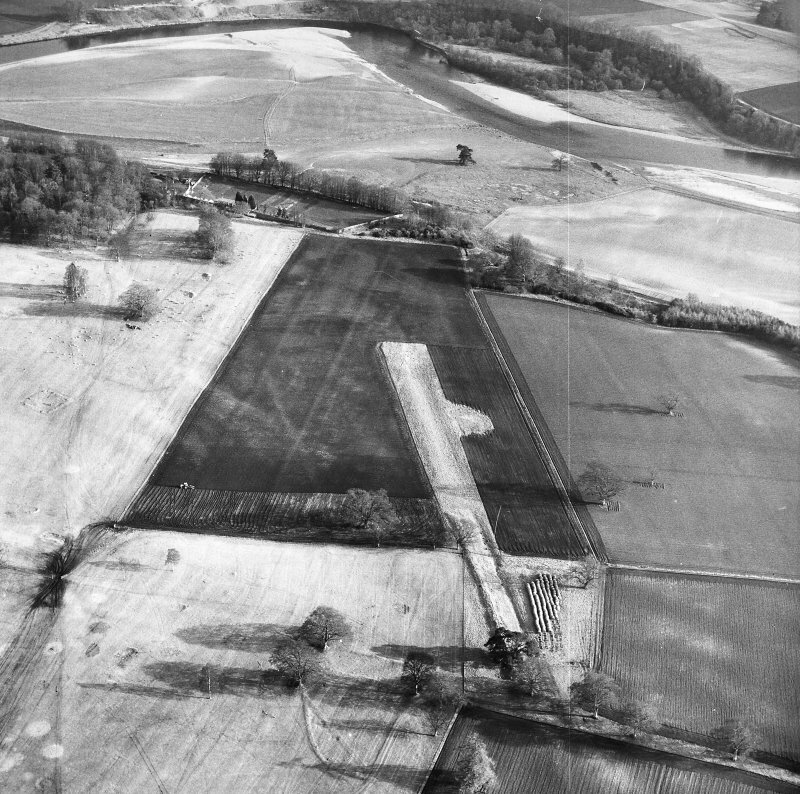 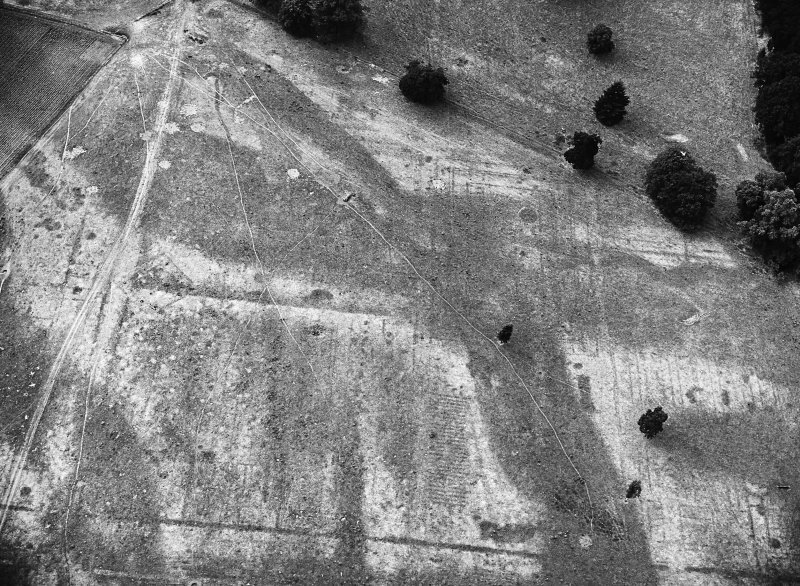 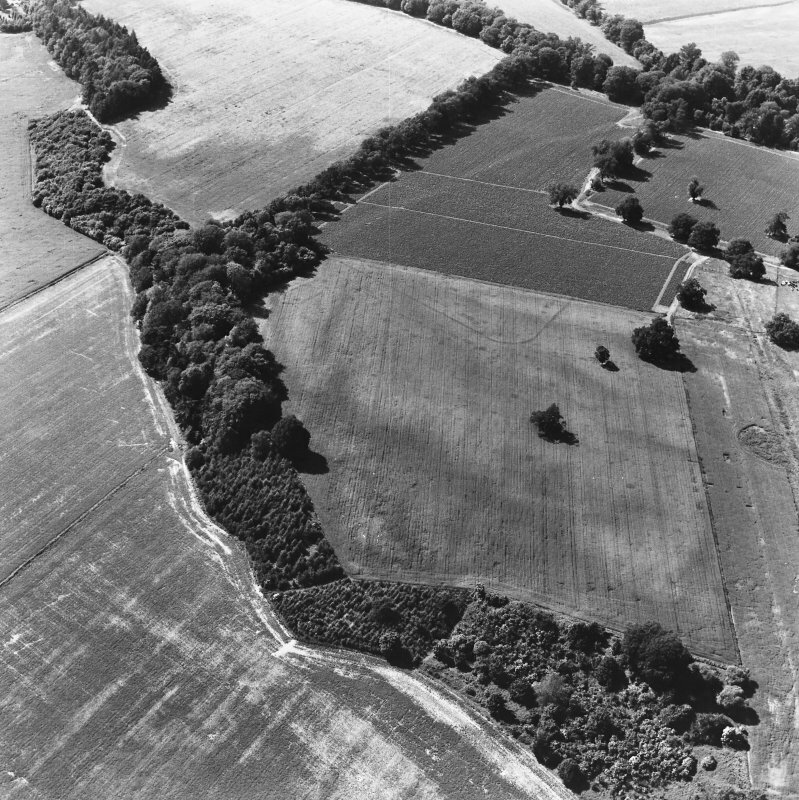 Excavation photograph showing the E defences, ditch and upcast mound. 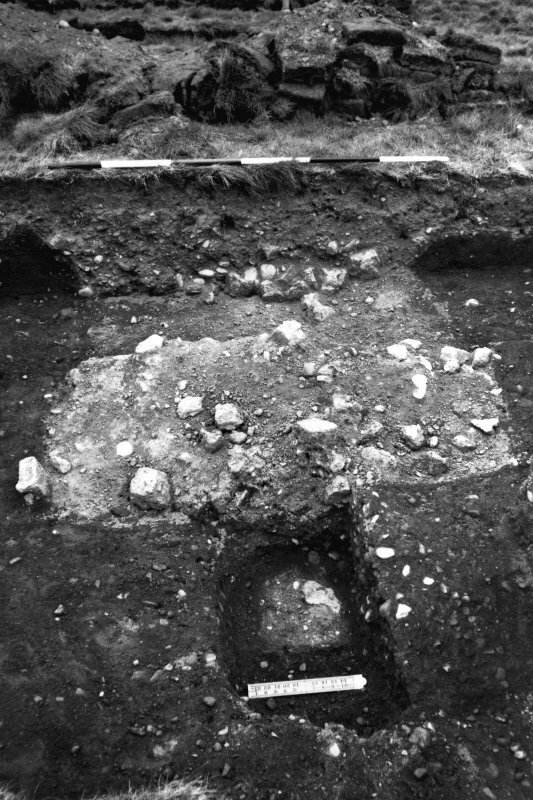 Excavation photograph showing the ritual pit in the centre of the Principia court. 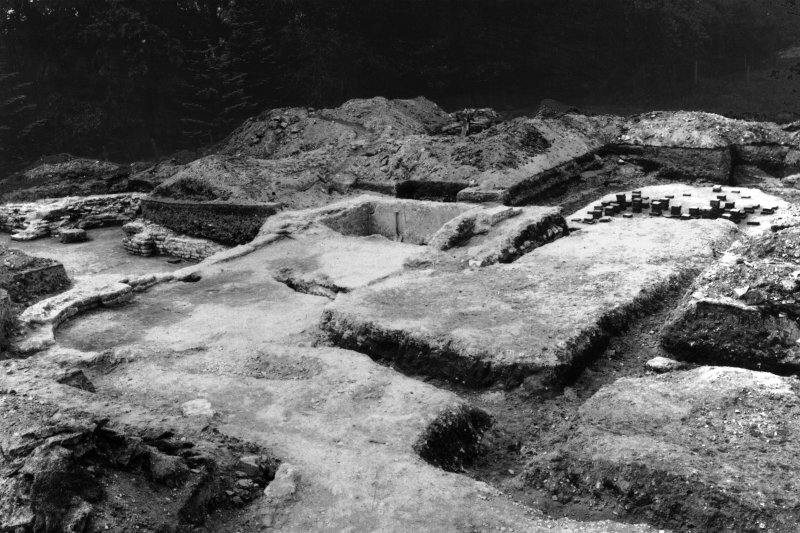 Excavation photograph: residence, room no. 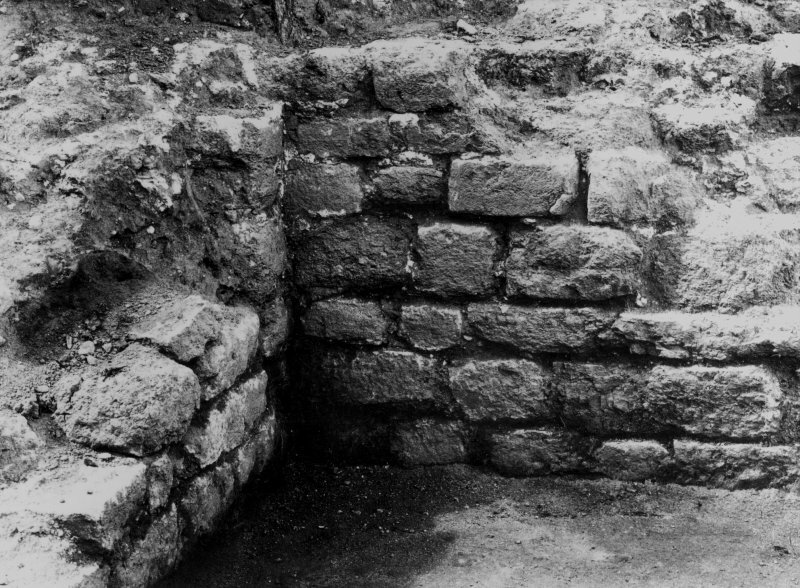 5, masonry of SW corner. 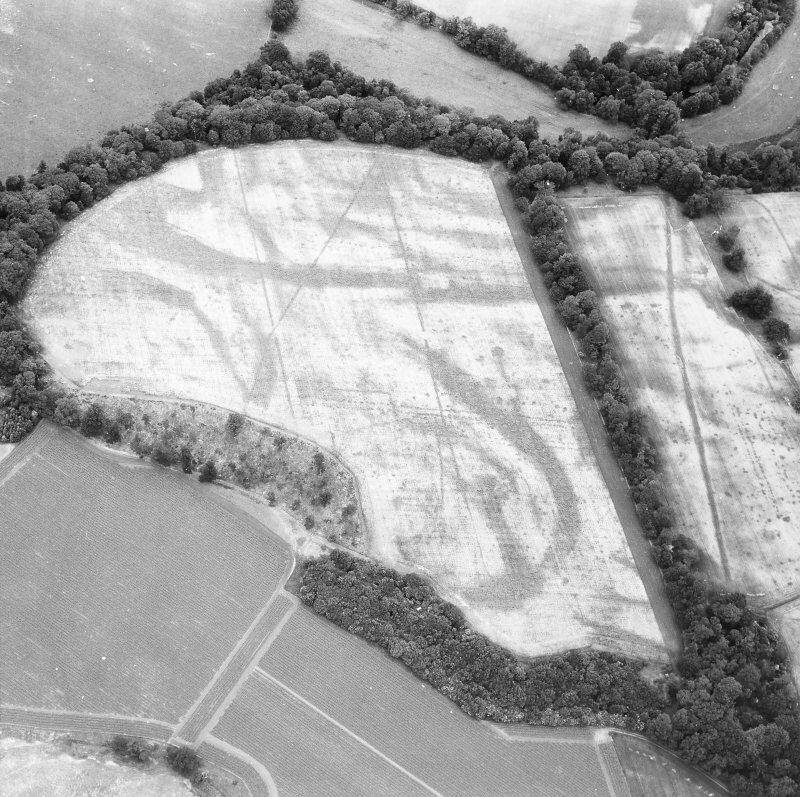 Oblique aerial view of Inchtuthil, looking ENE. 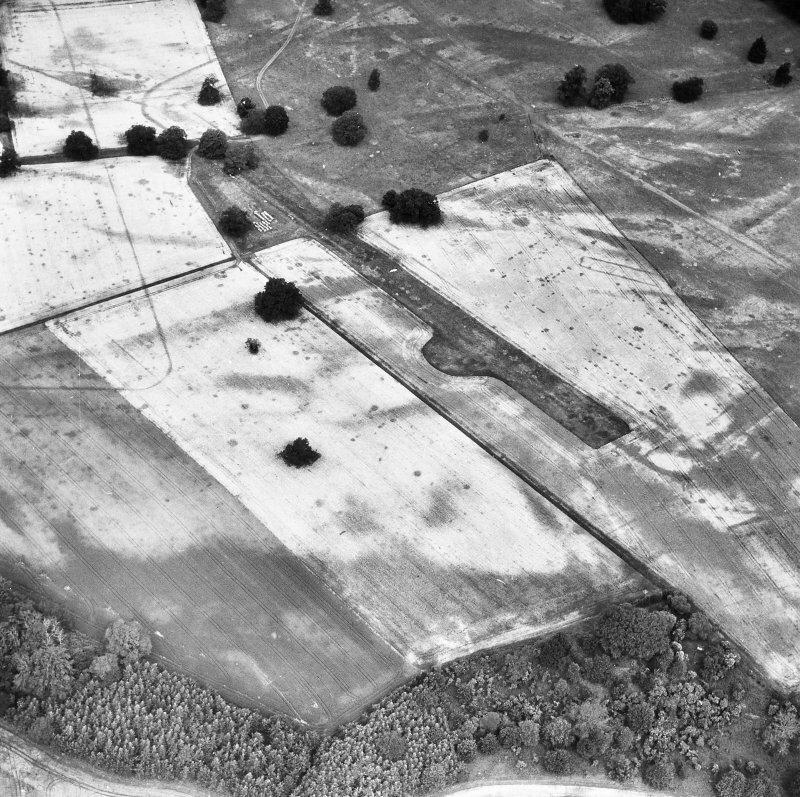 Oblique aerial view of the site of Delvine Golf Course and Inchtuthil, looking WNW. 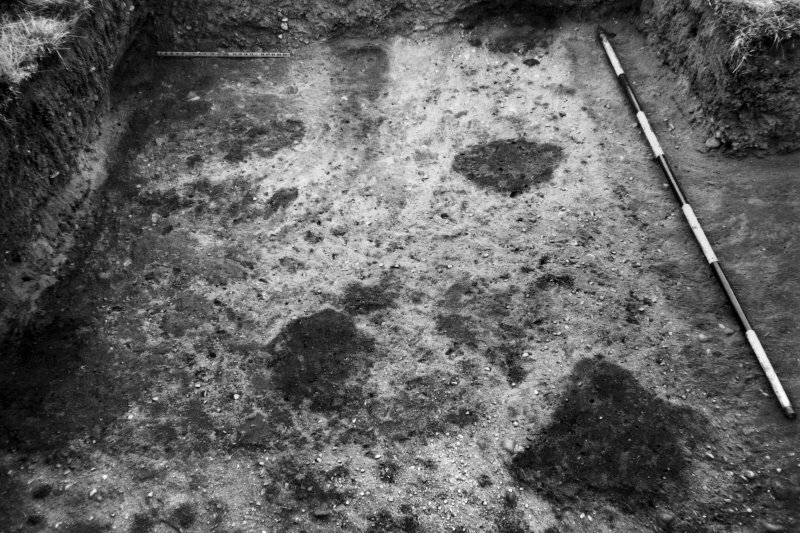 Excavation Finds: Flint Implements XLII p264. 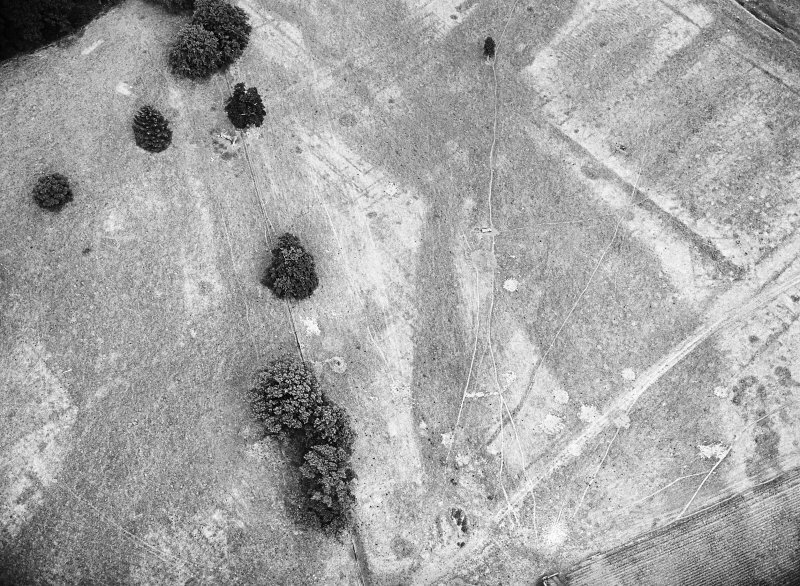 Excavation photograph showing the E gate, end of wall, with tower post-hole. 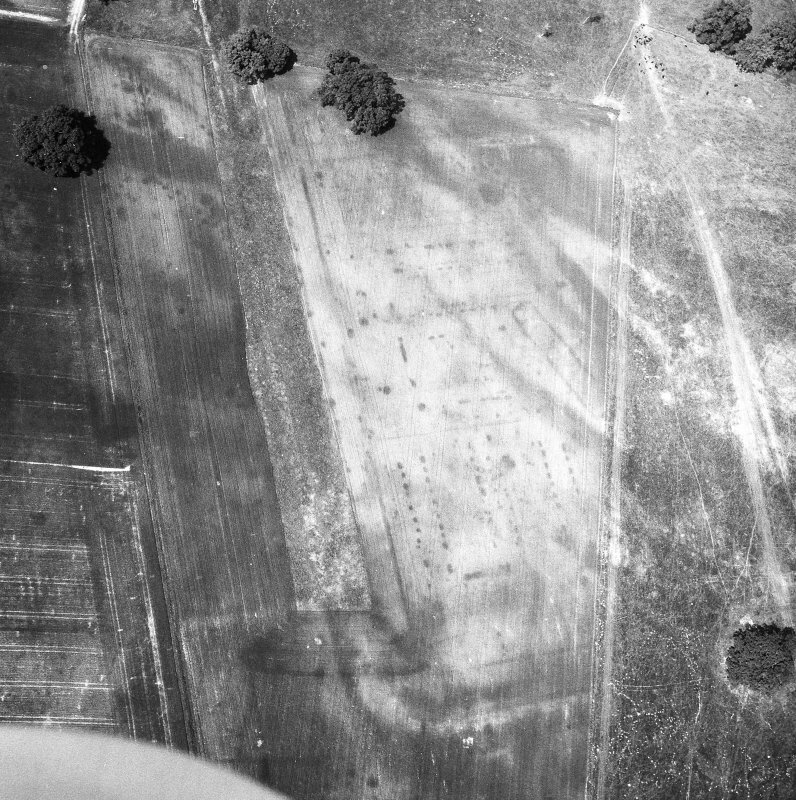 Excavation photograph showing the NE angle of the hospital corridor. 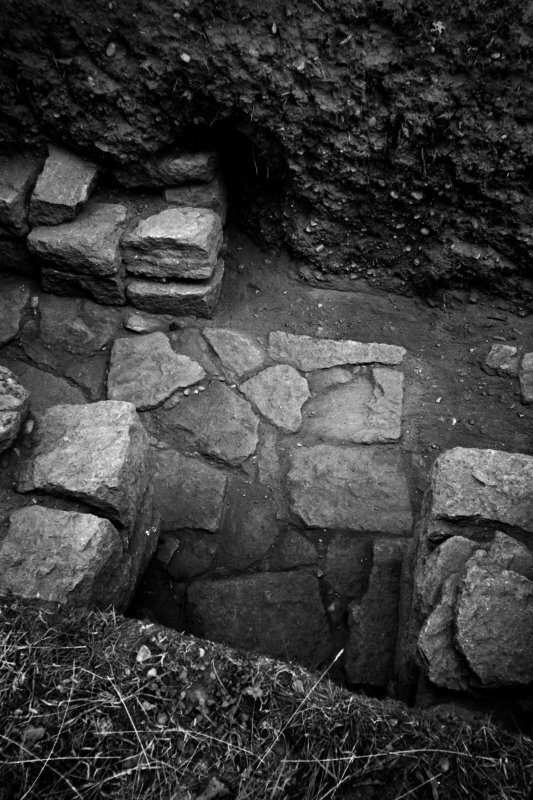 Excavation photograph showing the sewer junction in the barracks, looking N.
Excavation photograph: the hypocaust, at W end, looking S.
Excavation photograph: residence with hypocaust, bath etc, looking SW.
Excavation photograph: W wall and apse of rooms 4 and 5. 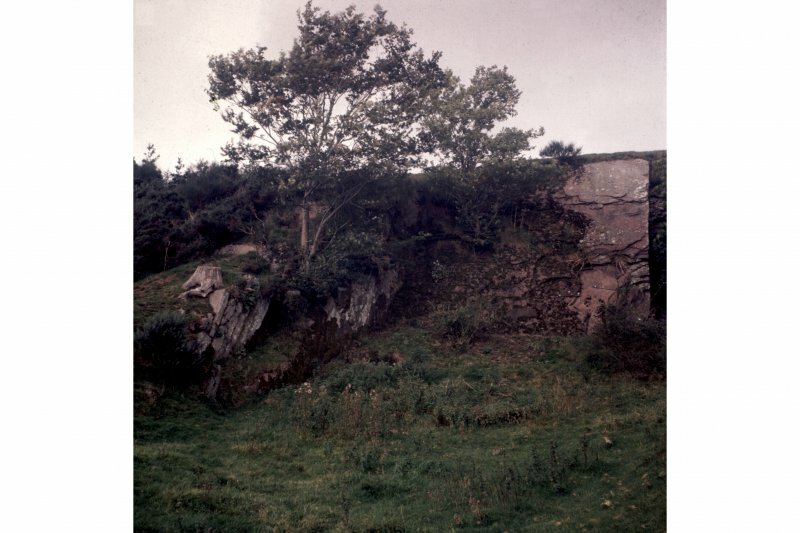 Quarry from which stone for the Inchtuthil Roman fortress was taken. 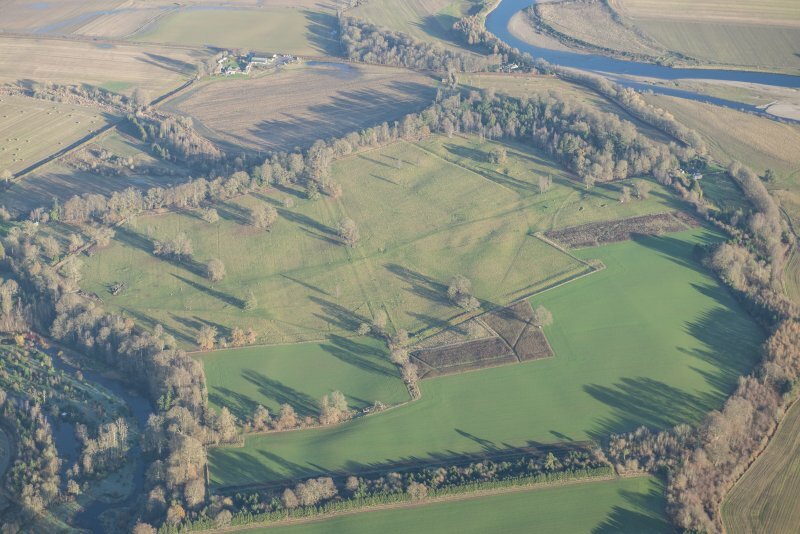 Inchtuthil Roman Fortress, oblique aerial view, taken from the WNW. 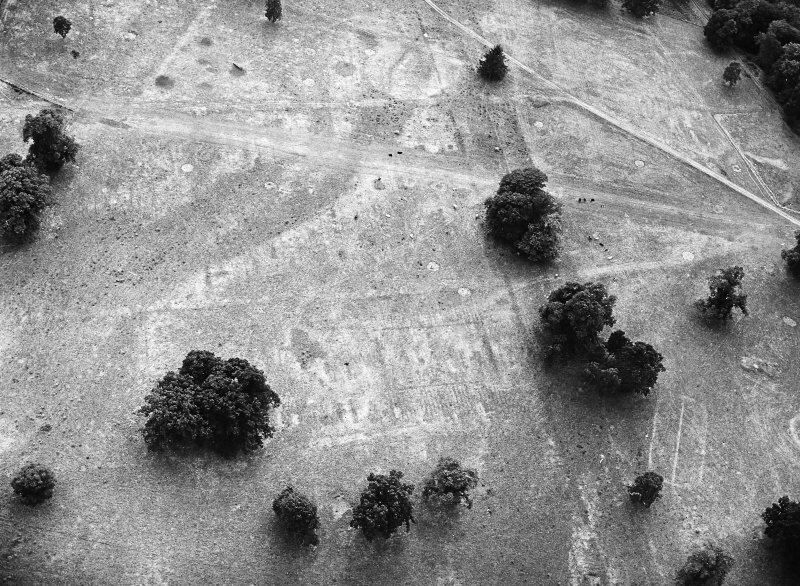 Inchtuthil Roman Fortress, oblique aerial view, taken from the SW.
For fort (NO 1152 3930) incorporating Roman stone, see NO13NW 6. 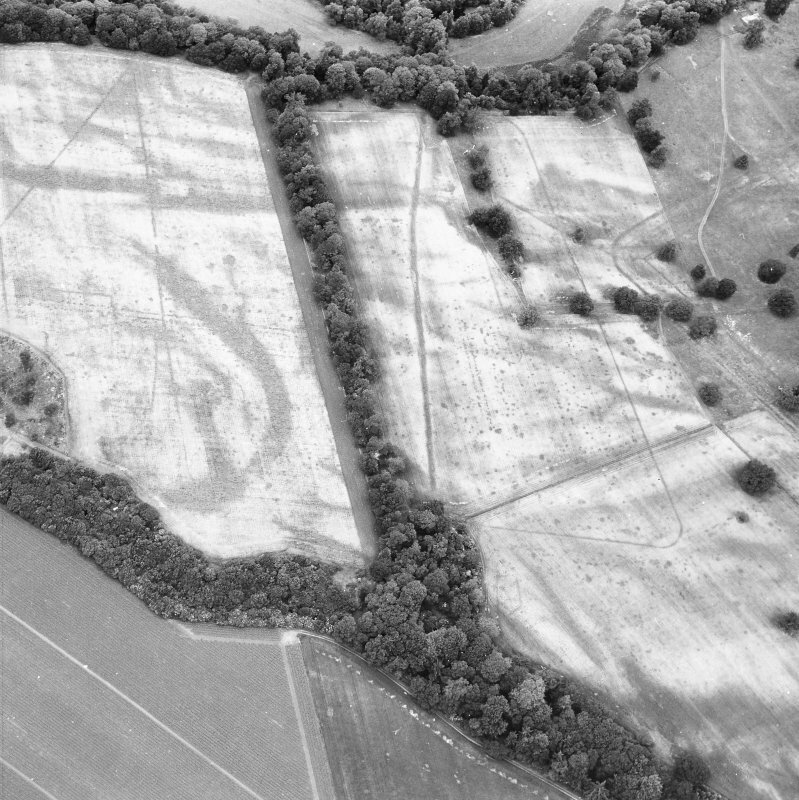 For barrows at NO 1279 3968 and 1274 3968, see NO13NW 7.00. 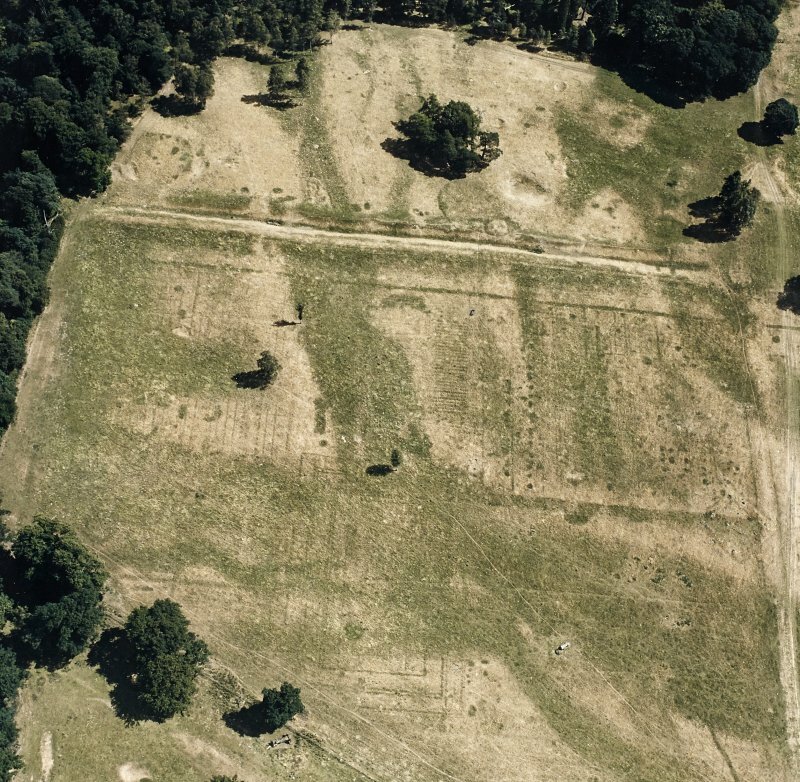 The Legionary Fortress at Inchtuthil, known as Pinnata Castra, was founded by Agricola soon after AD 83 and systematically demolished soon after AD 86. 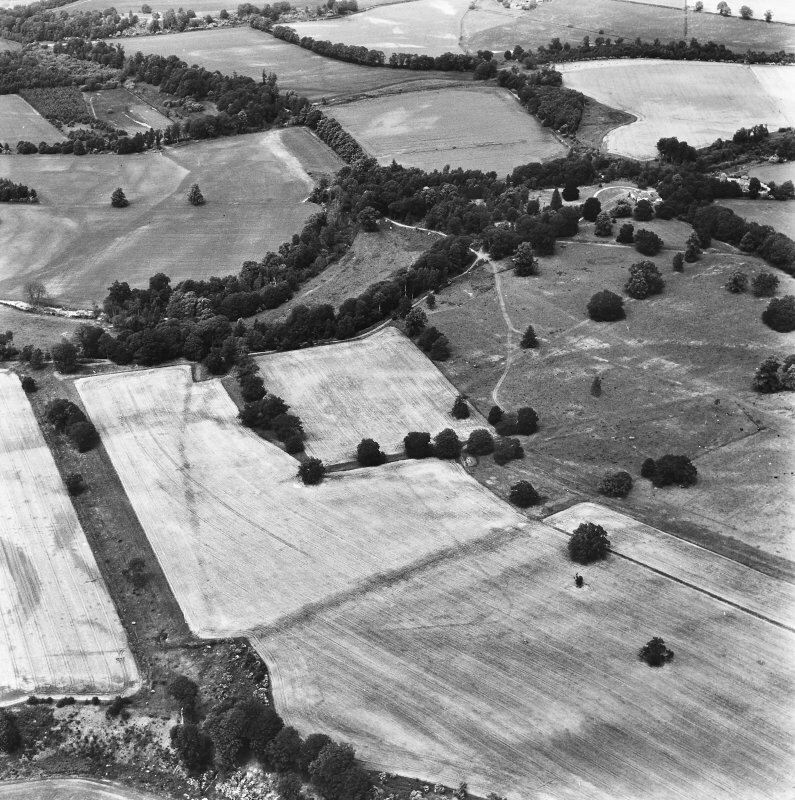 The defences comprise a single ditch, 20' wide by 6 1/2' deep, and a turf rampart, now 13' wide but cut back to receive a stone wall 5' thick. 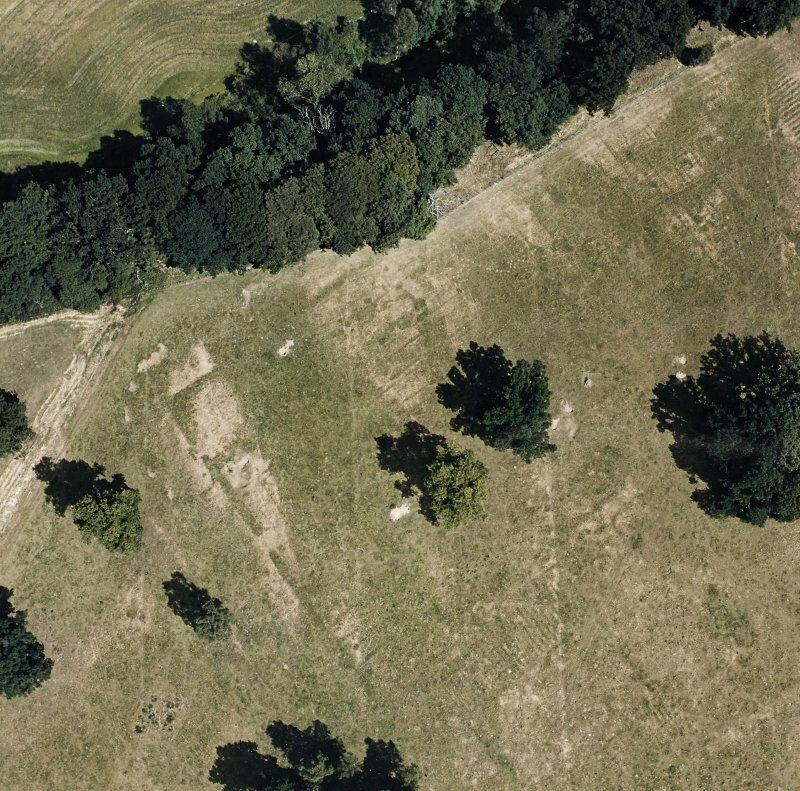 The wall encloses an area of 1,520' by 1,565', or 53 acres. 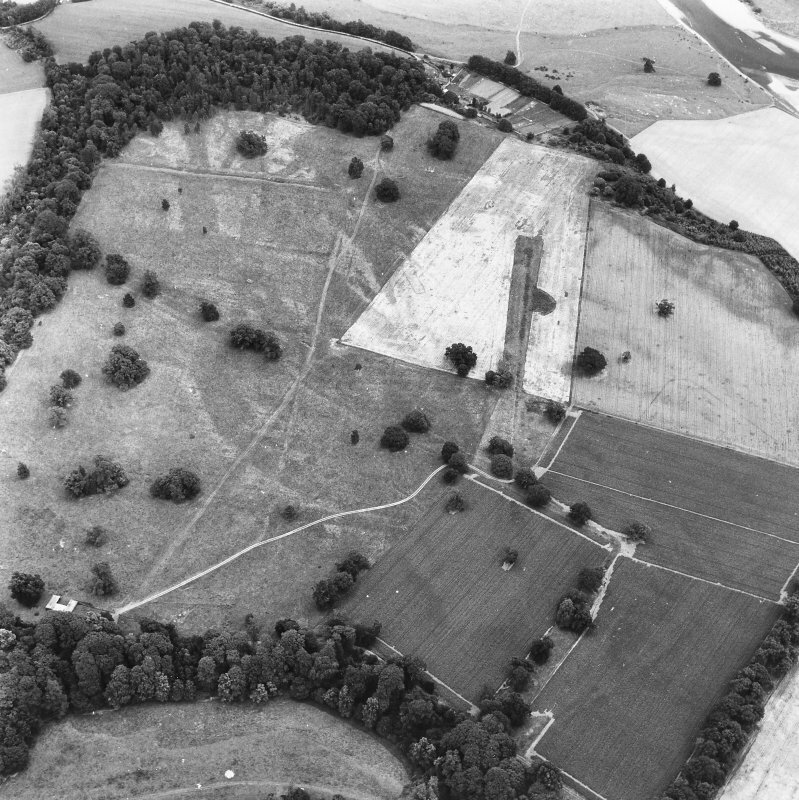 The gateways were of timber,with twin portals recessed between two towers 20' square. 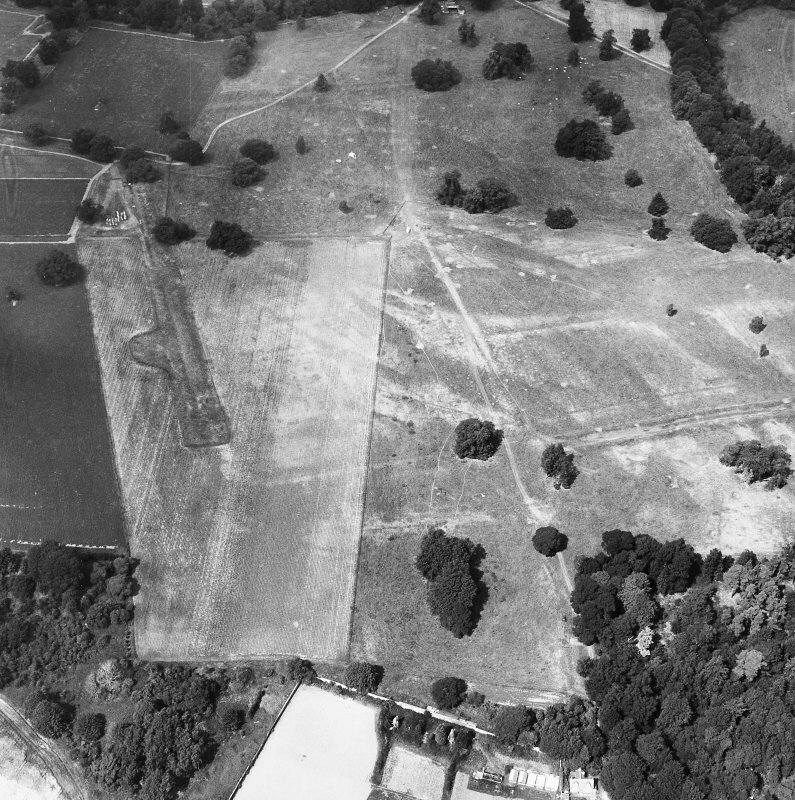 Internal buildings comprise the headquarters, officer's houses, 64 barracks, 6 granaries, stores sheds, military hospital, drill hall and construction shop. 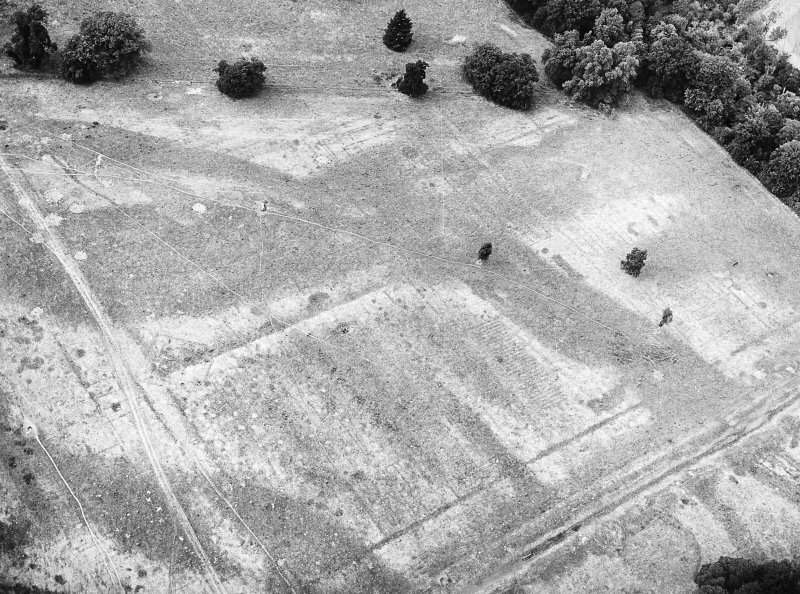 Not all the buildings, however, had been built before the fortress was deliberately dismantled, following the transfer of Legio II Adiutrix to the Danube frontier. 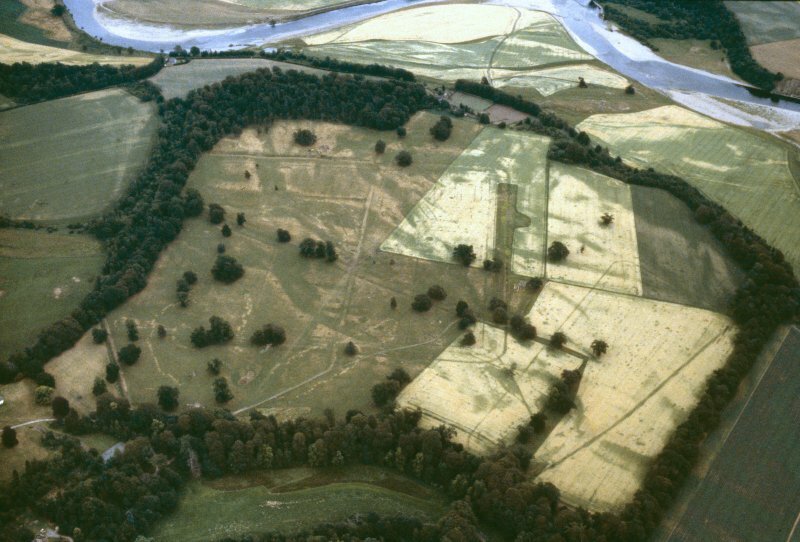 Other visible Roman remains comprise the redoubt and a linear earthwork (the western vallum) W of the fortress is the site of a 'labour camp', almost as large as the fortress, which was occupied during the construction of the latter, and gradually reduced in size as the work progressed. 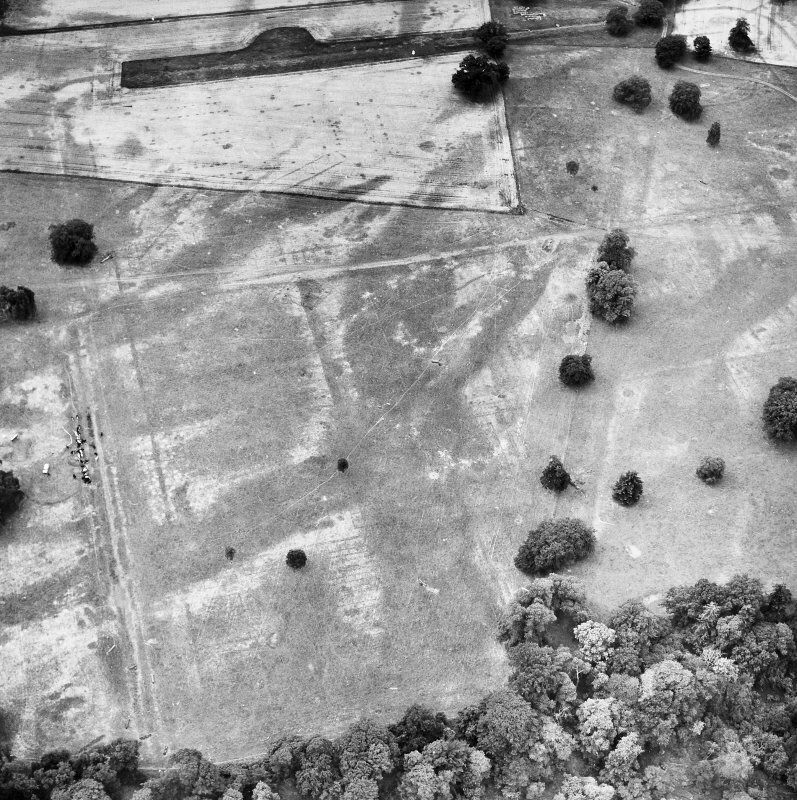 There was yet another temporary camp towards the SW tip of the plateau, and an extra-mural senior officers' temporary compound on the SE angle of the fortress. 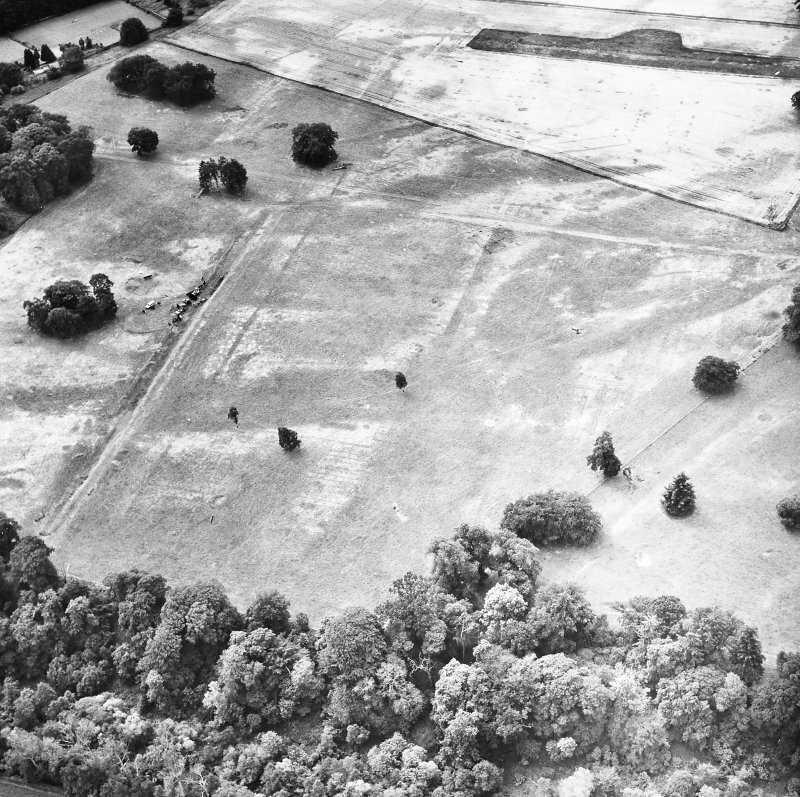 Inchtuthil was excavated by Abercromby in 1901, and by Richmond and St Joseph between 1952 and 1965. 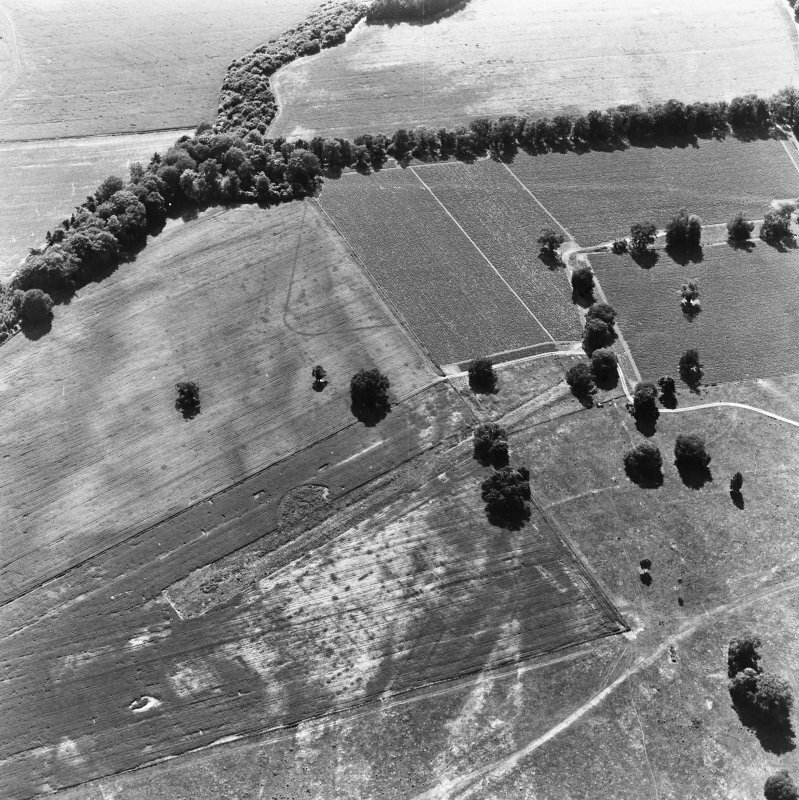 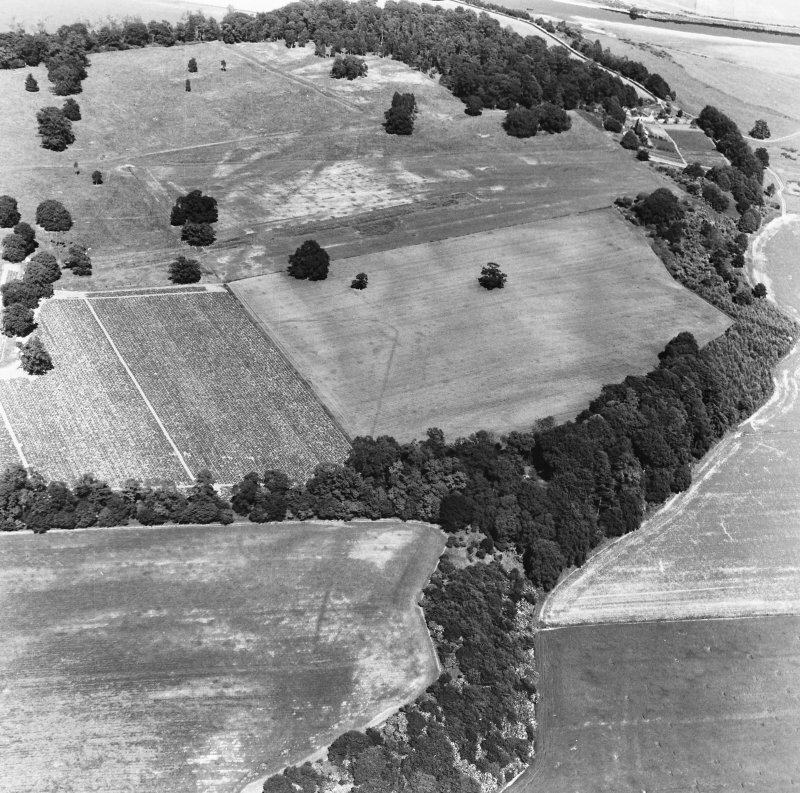 When visited in 1969, the remains of the fortress were as described above, the ditch and rampart being extant either separately or together along most of the S, E, and W sides. 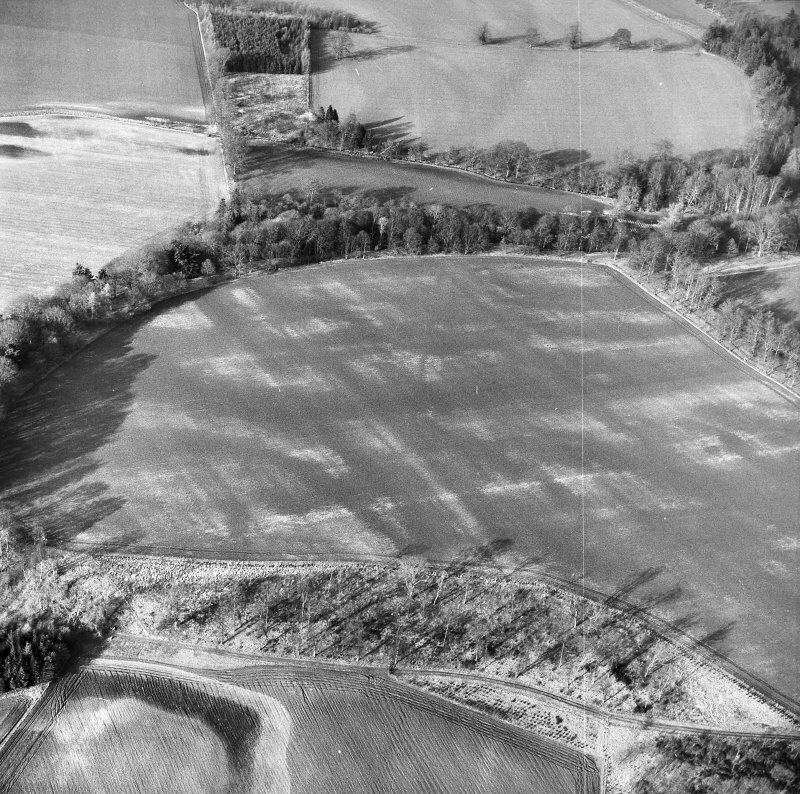 The N side, along the edge of a steep natural scarp was less well defined, and was probably greatly affected by erosion, but a mound, defined by a slight scarp (1.0m max height), and extending c. 130.0m, W from the NE angle, probably indicated the N rampart, traces of stone walling being visible on top of the mound at NO 1273 3988. 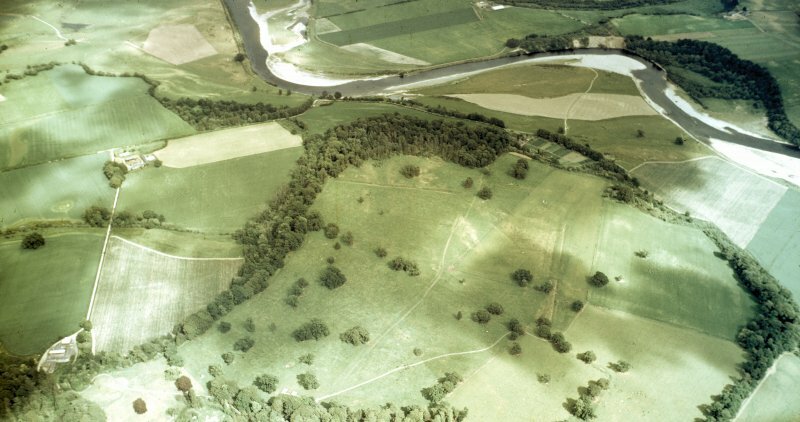 The redoubt comprised a sub-rectangular enclosure formed by a well-defined 'L'-shaped rampart and ditch backing on to steep natural slopes to the S and E with the possibility of the rampart having formerly continued along the top of the S slopes. 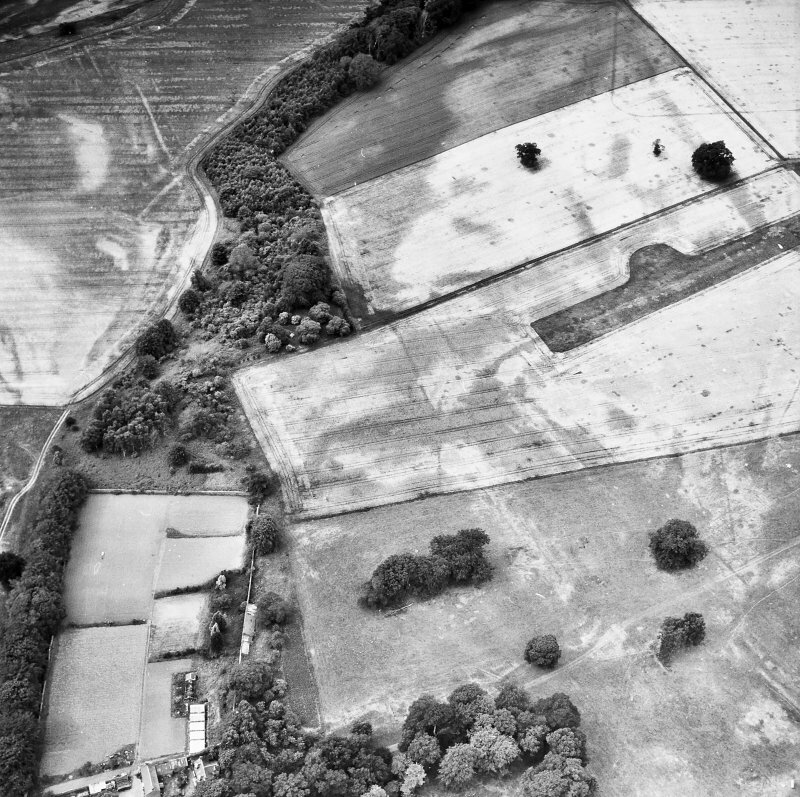 The vallum was an earthwork comprising a rampart and ditch now ploughed out except for a small portion at its N end. 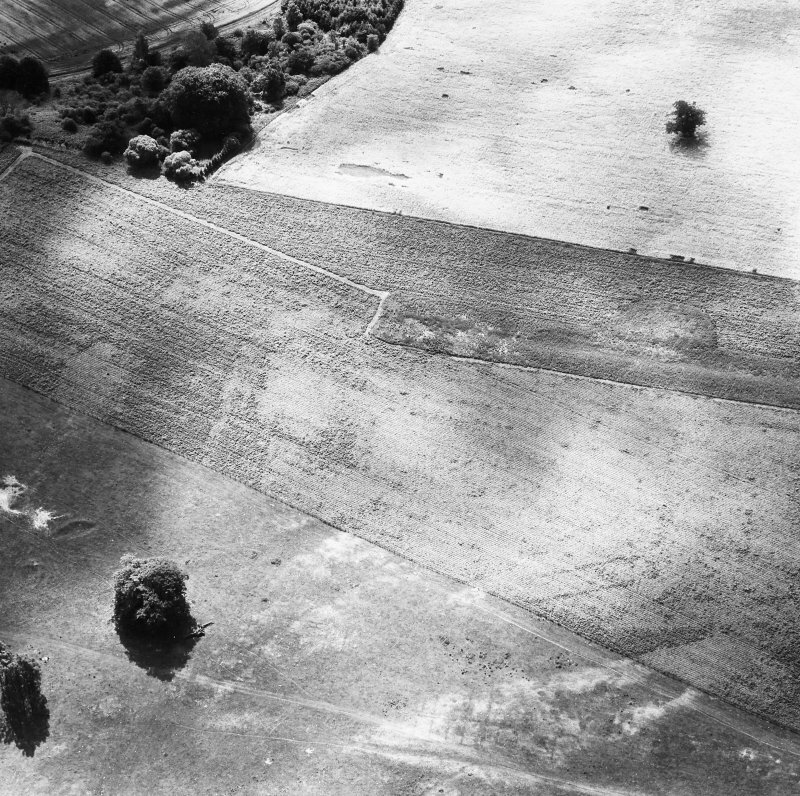 The rampart is traceable as a slight swelling in the ploughed field. 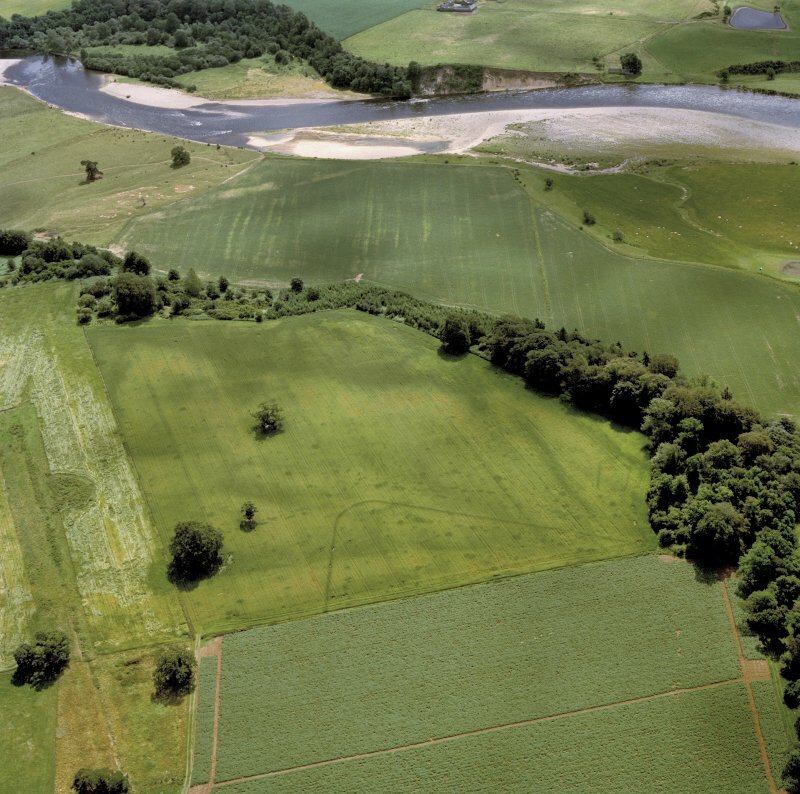 Roman finds from Inchtuthil are in Perth Museum, and National Museum of Antiquities of Scotland (NMAS). 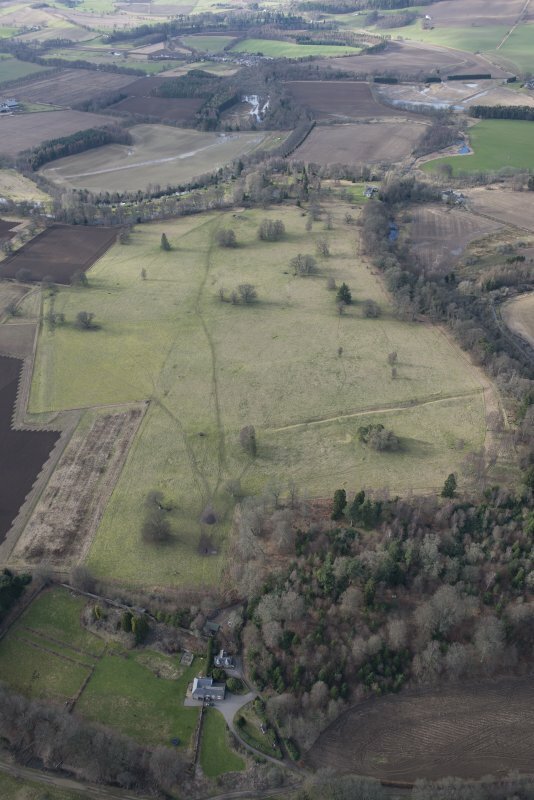 A floor tile from the fortress site has been donated to Perth Museum and Art Gallery (Acc No 1988.108). 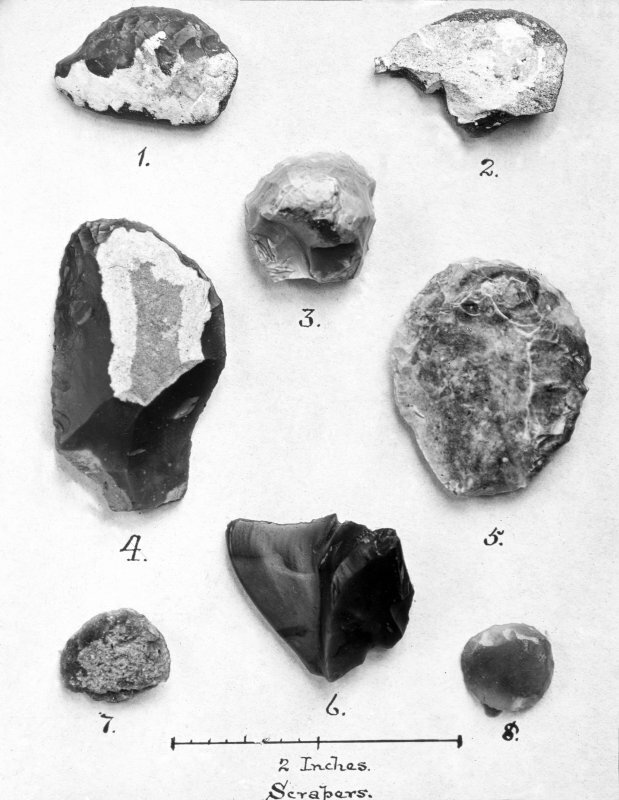 NO 125 397 The late Prof St Joseph discovered an iron ballista head among a small assemblage of nails he had retained from the hoard discovered inside the fabrica. 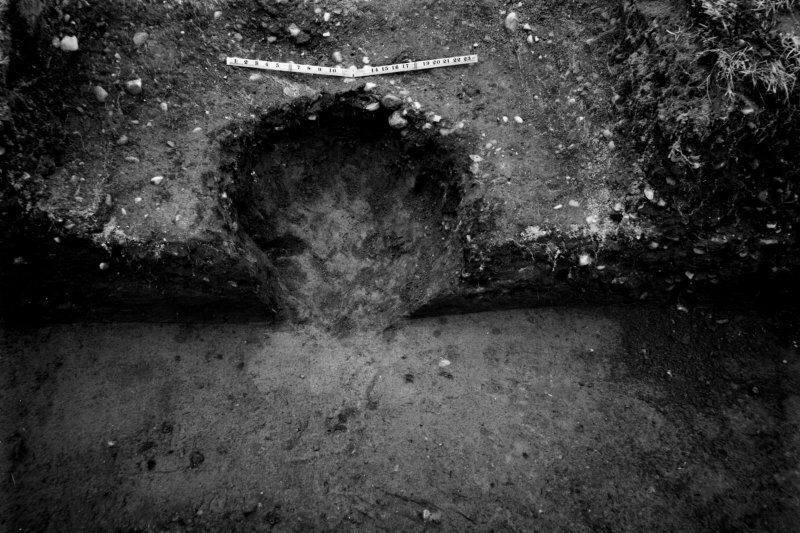 This is the first such item recognised from the hoard. 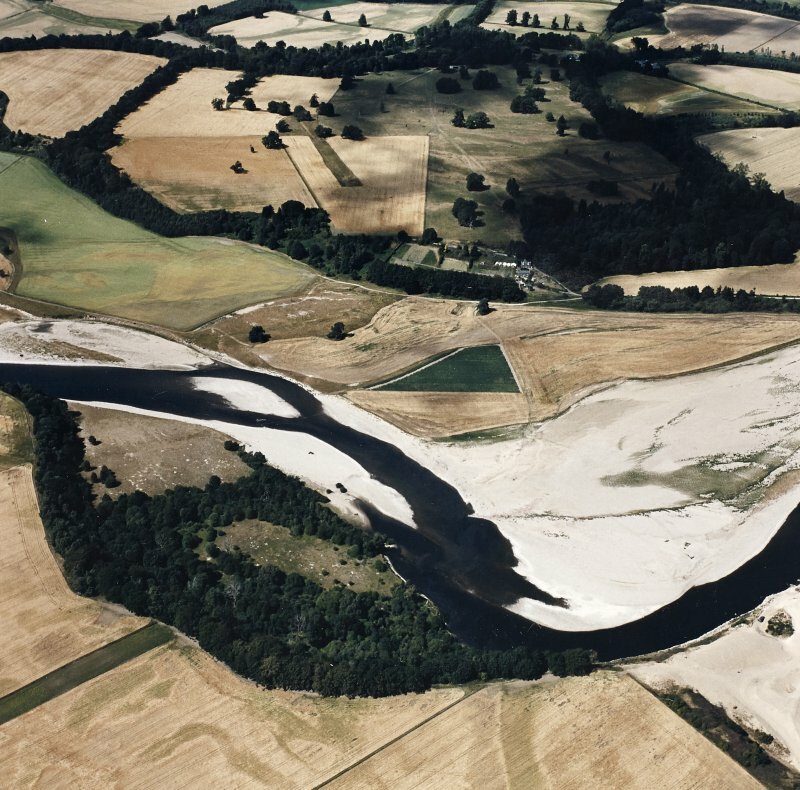 Legally donated to National Museum of Scotland (NMS). 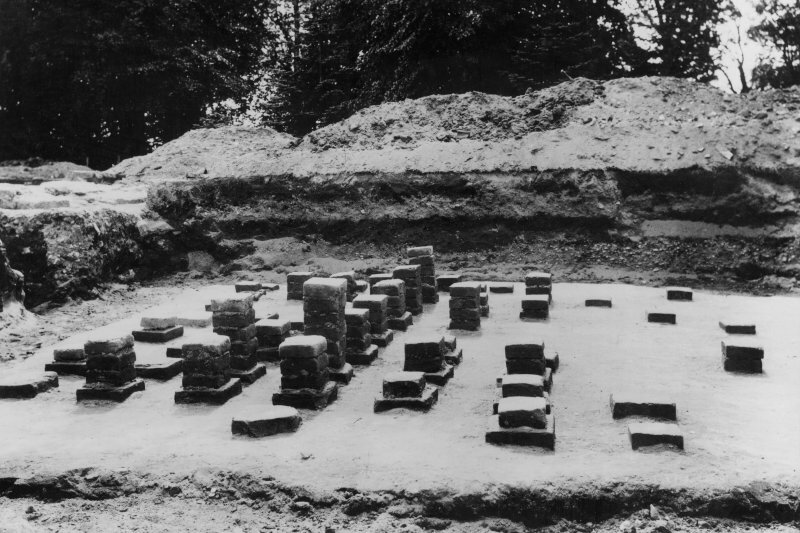 Inchtuthil was excavated by Ian A Richmond and Professor J K St Joseph. 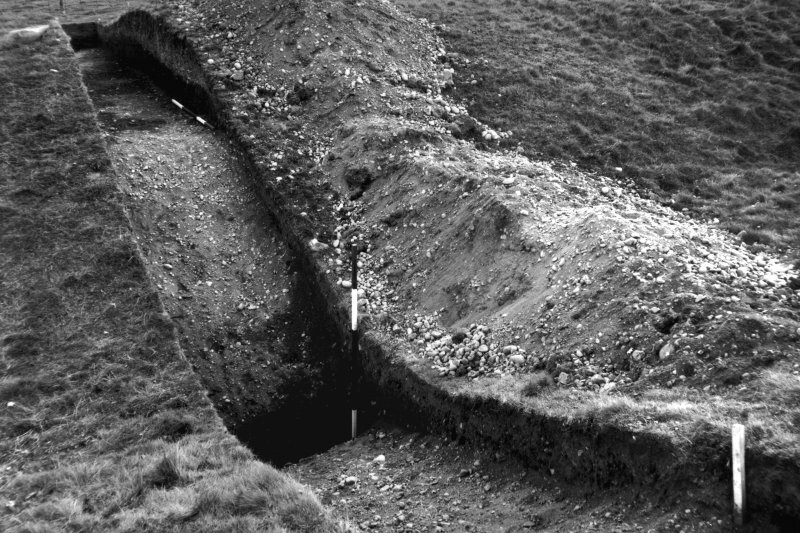 trenching in the 1960s, albeit with one large new structure in the NW. 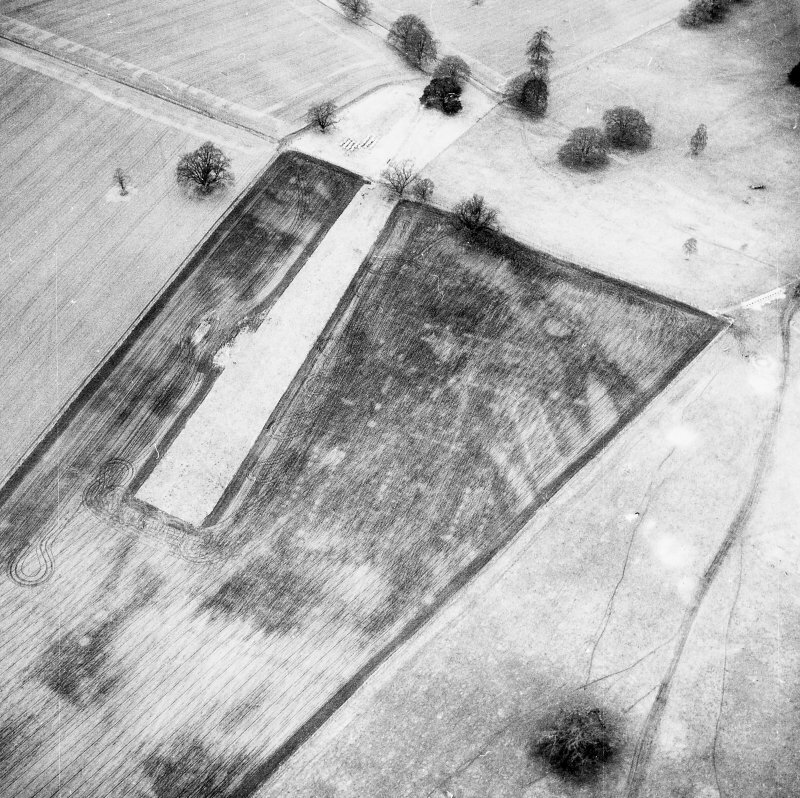 However, when seen in full, rather than in narrow test trenches, the buildings proved to be less neatly rectangular. 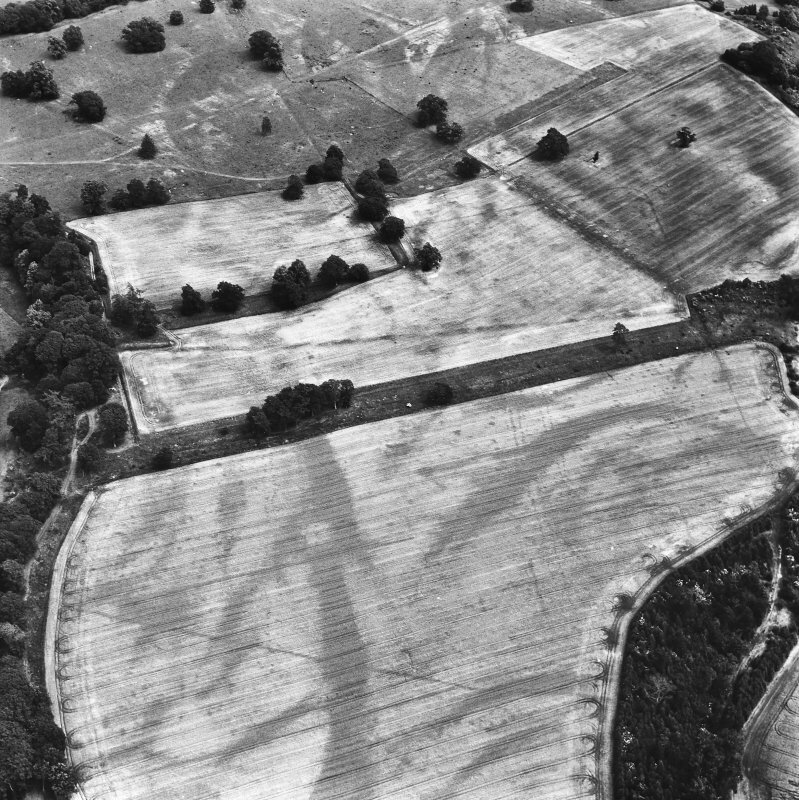 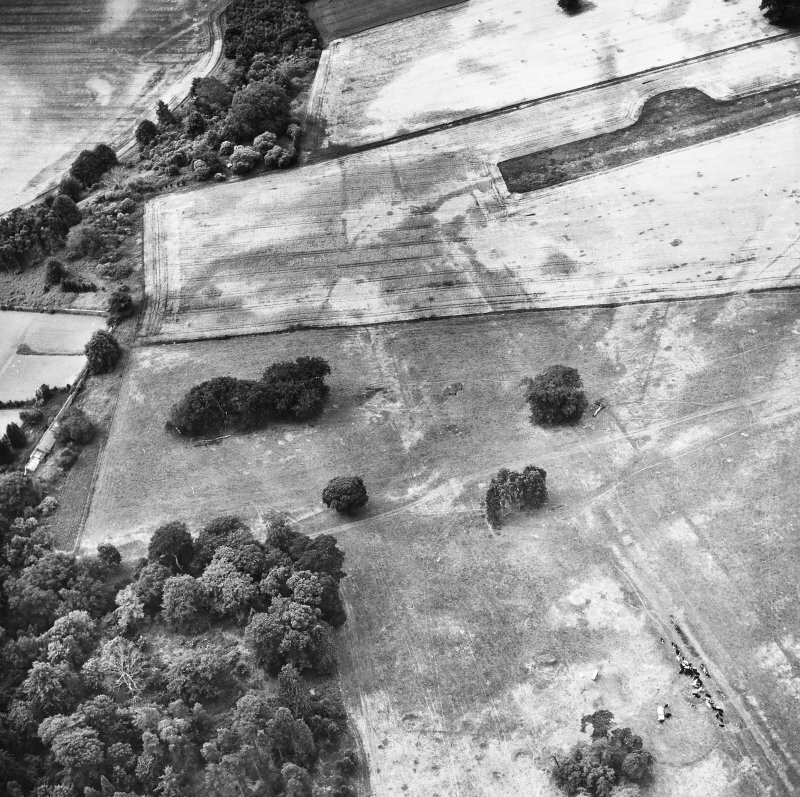 To the E, the surveys revealed a large oval feature just outside the fortress gate and the known barrow field proved to be more extensive than surface and aerial data had shown. 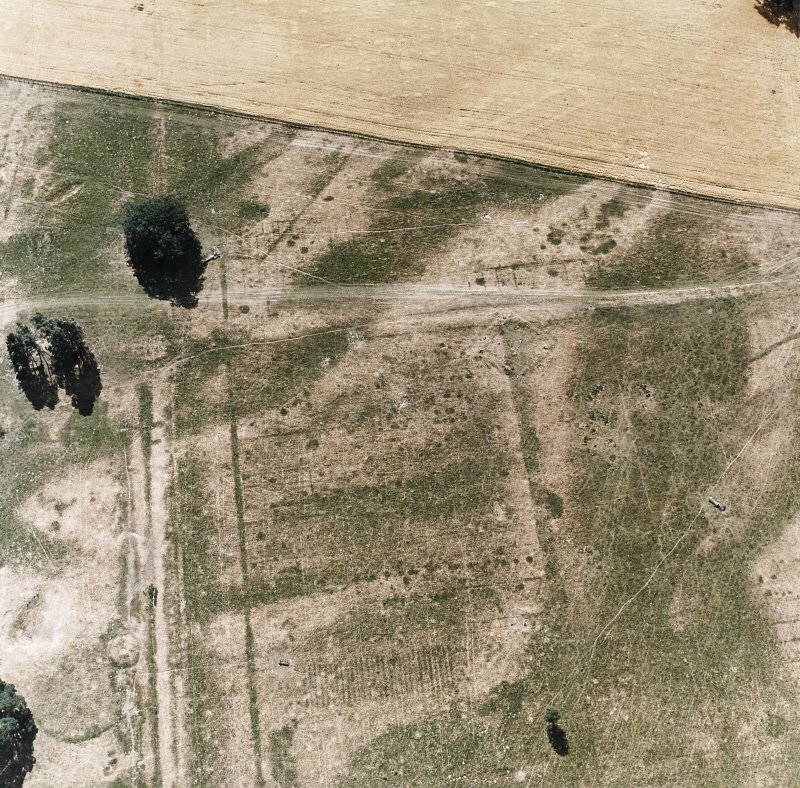 To the W, a series of pits might represent a cemetery or settlement, and the resistance work located what may be concentric rectangular features. 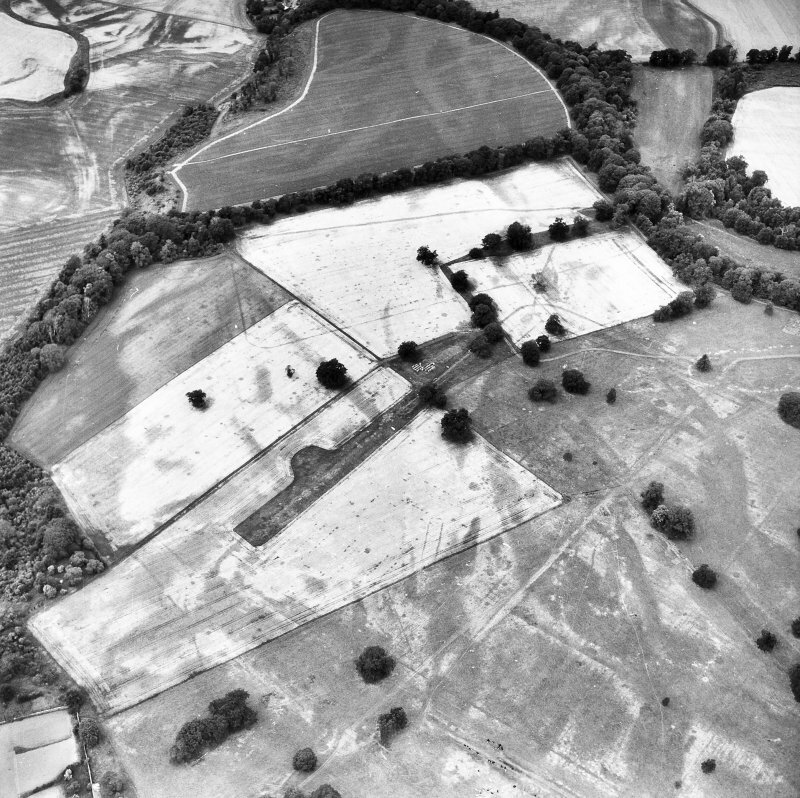 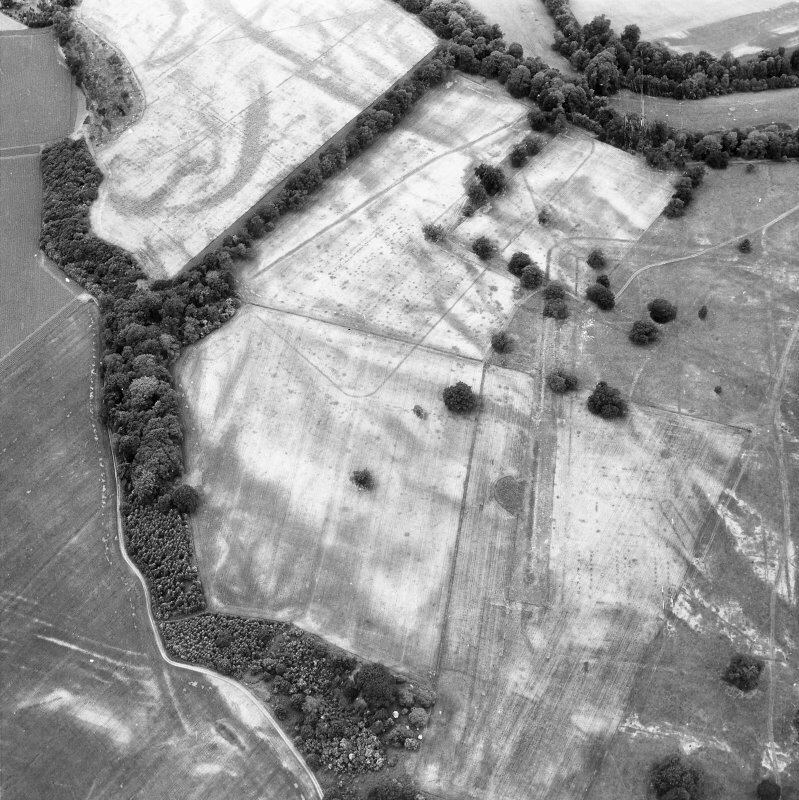 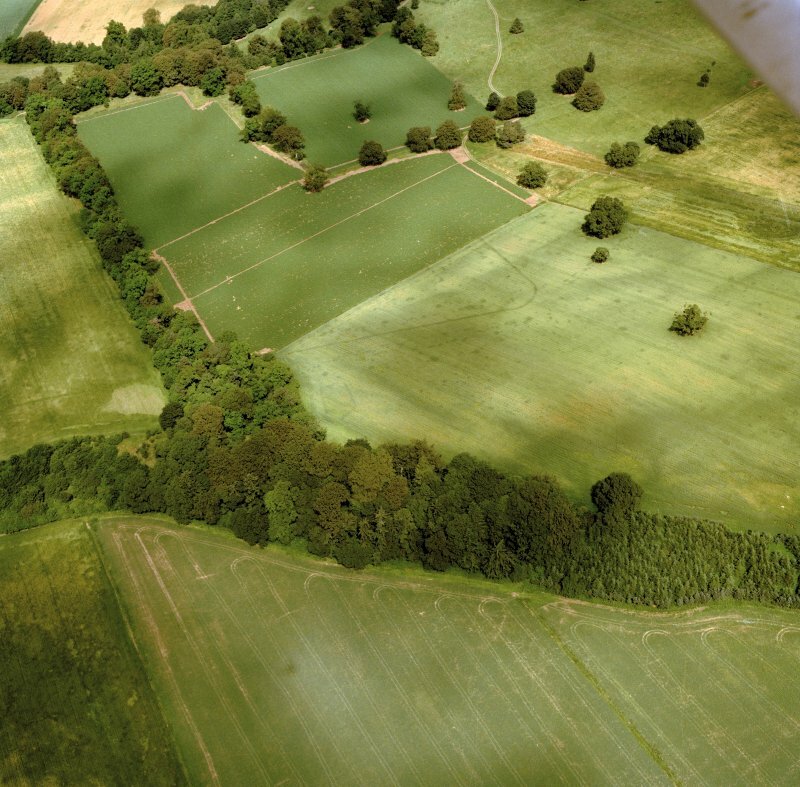 To the SW, the surveys confirmed aerial indications that an area of dense pitting extends well beyond the confines of the long known temporary camp, right up to the fortress defences. 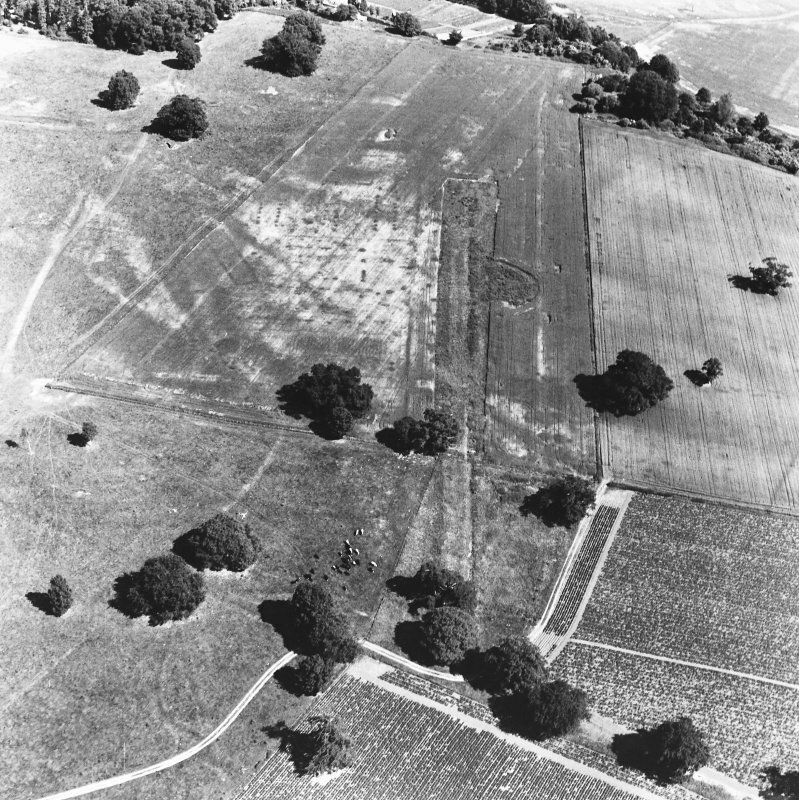 The fieldwalking found Roman finds and copious signs of leadworking in the same area, which may suggest external industrial activity and possibly settlement. 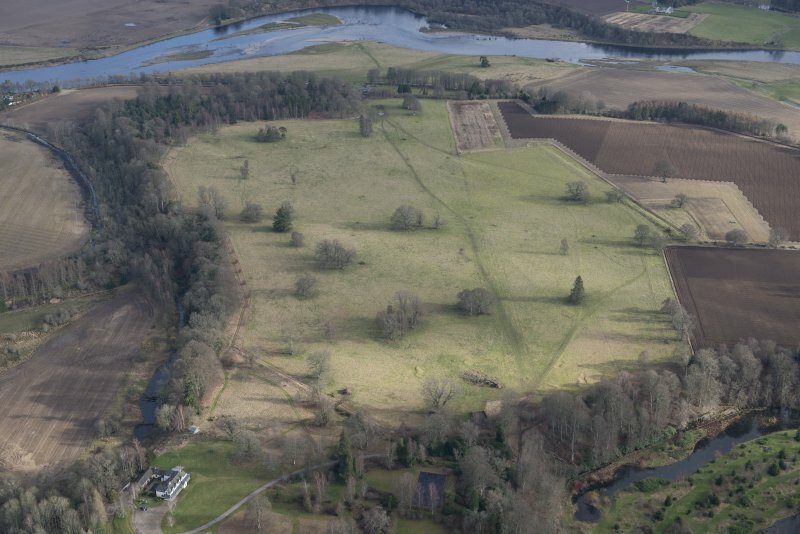 An archaeological watching brief on topsoil stripping and excavation required for a house extension at The Gardens, Delvine, Spittalfield, located within the defensive outworks of the Roman Fortress of Inchtuthil and covering an area of 96m². 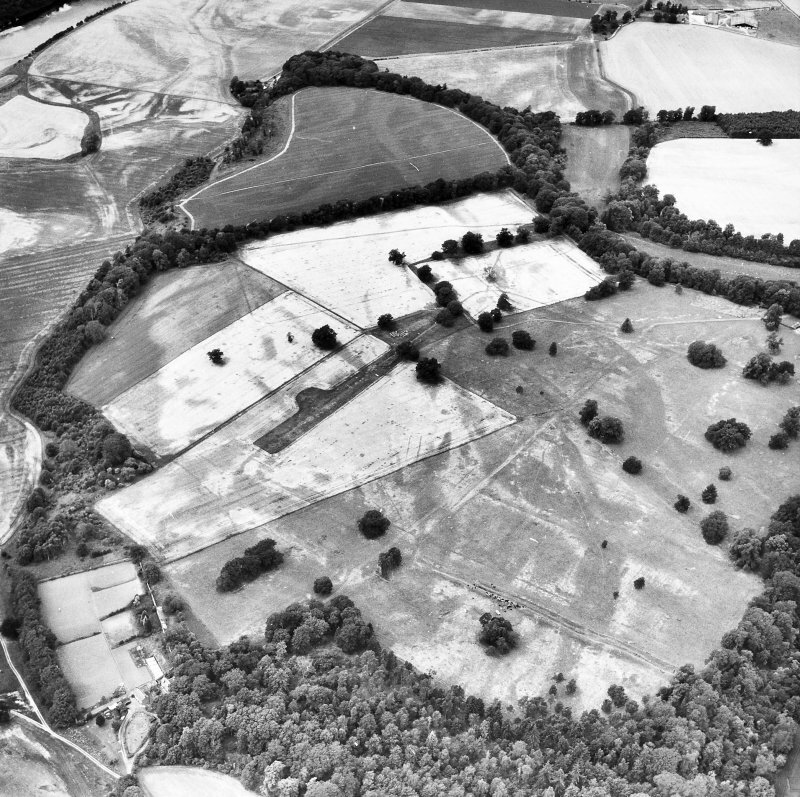 Along with modern pottery, three sherds of late medieval/post-medieval pottery and three sherds of what were considered to be Roman pottery were recovered from garden deposits. 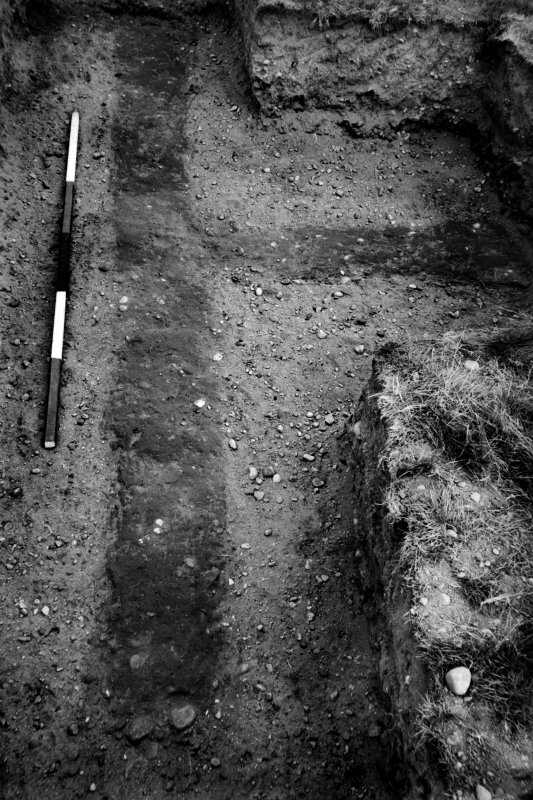 Cuts in the subsoil/natural revealed recent working as part of a garden vegetable plot. 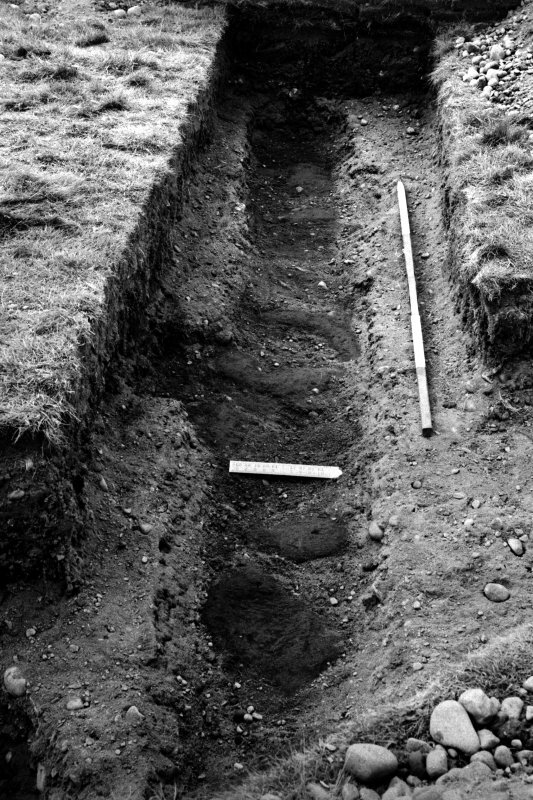 A stone floor or surface was found that was tied into the foundation of the house wall and was considered to be a stance for an outside tap. 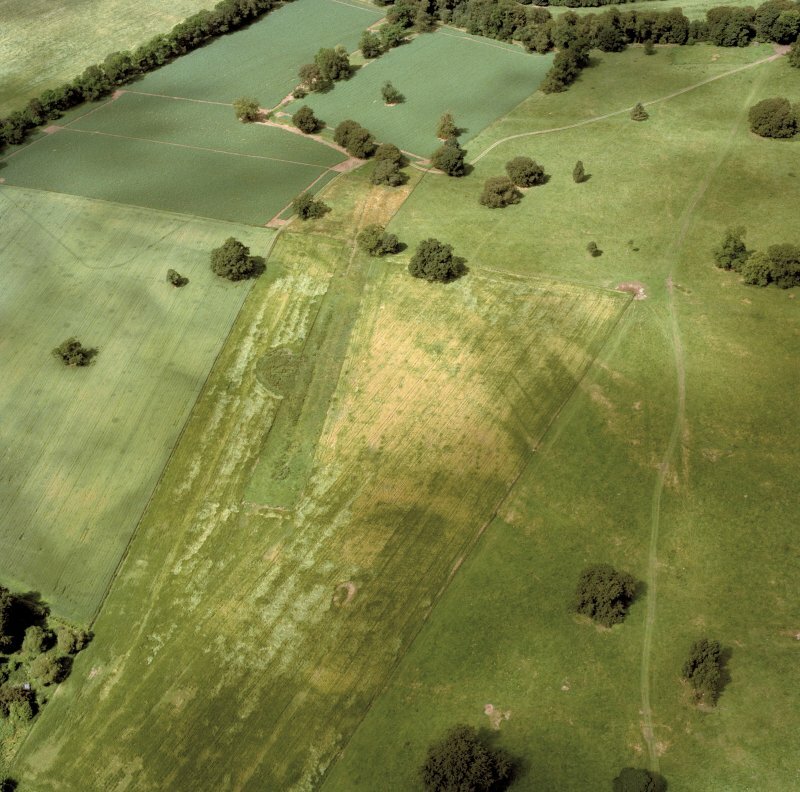 Although some medieval and possibly Roman pottery sherds were found, no discrete features or deposits relating to these periods or any other period, apart from modern, were found. 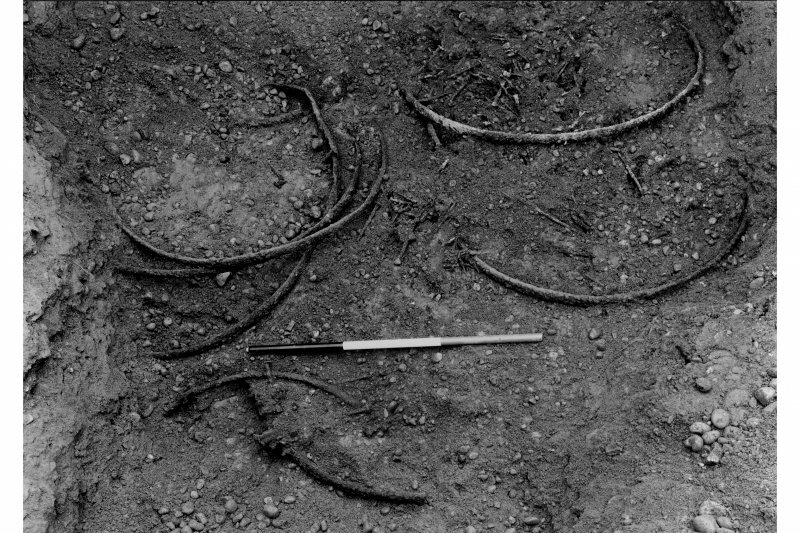 lead working debris and other finds both inside and outside the camp. 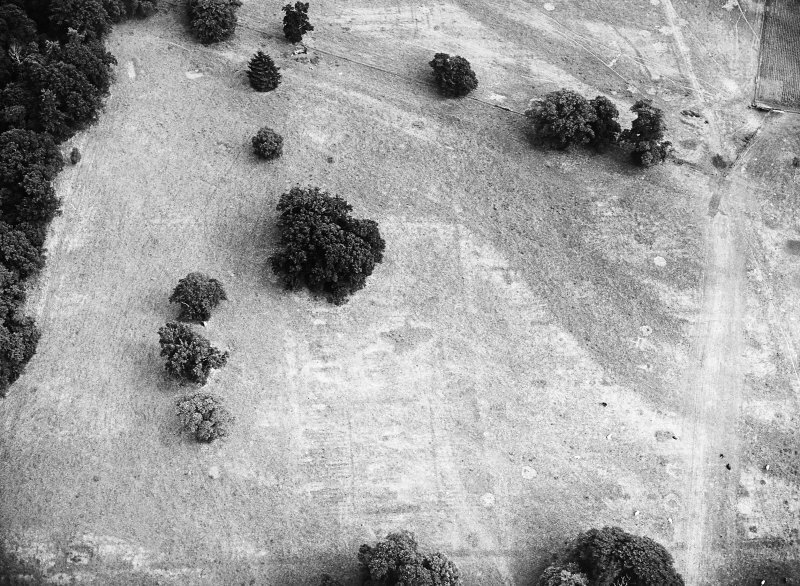 At the SW end of the Inchtuthil plateau, a second enclosure has been seen from the air which has been taken to be a much smaller temporary camp, estimated at only 0.94ha. 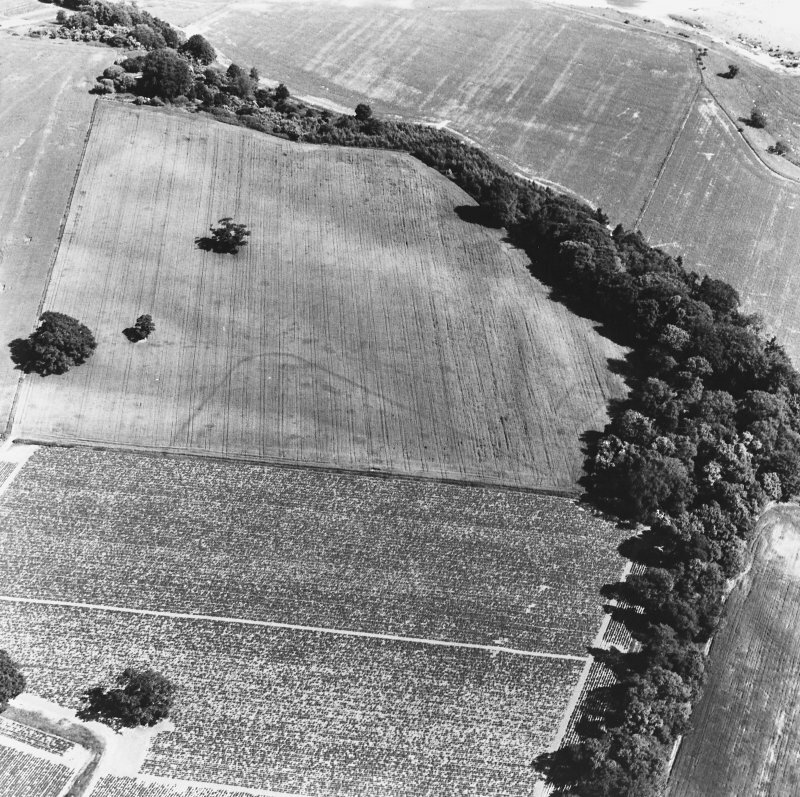 The camp was surveyed in its entirety, except for a small area at the NE corner, which was planted with a cover crop and inaccessible. 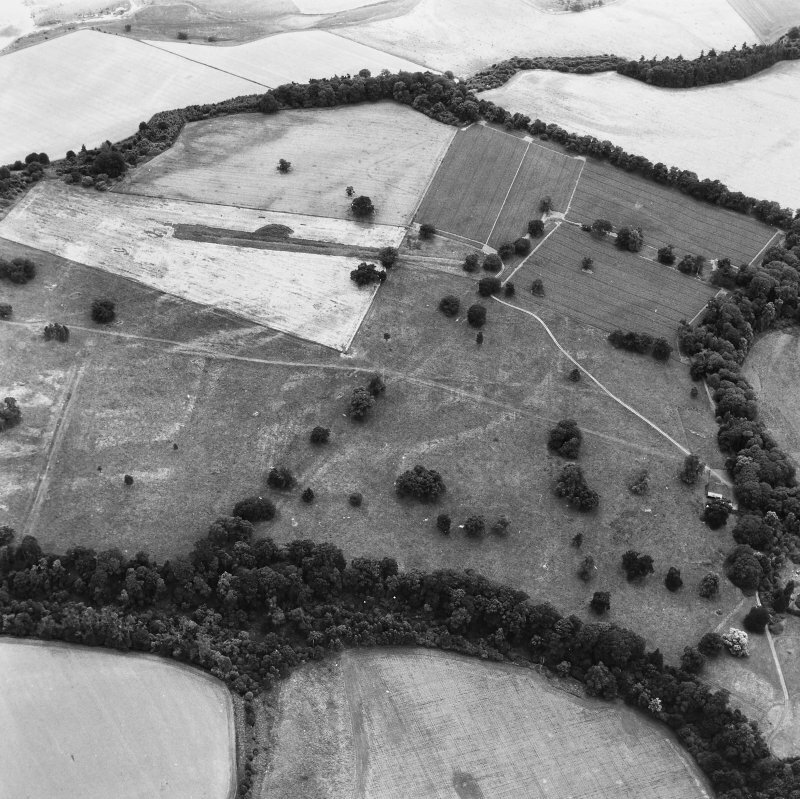 It proved to be slightly smaller still at c125 x 70m (0.87ha). 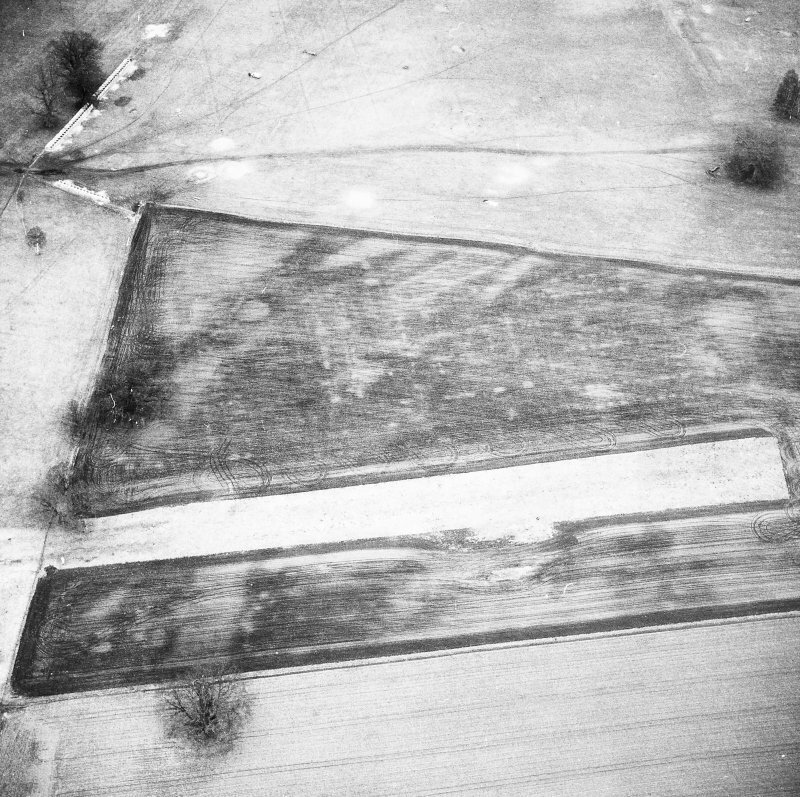 The N, S and W ditches were detected clearly, but no trace of an entrance break was found in any of them. 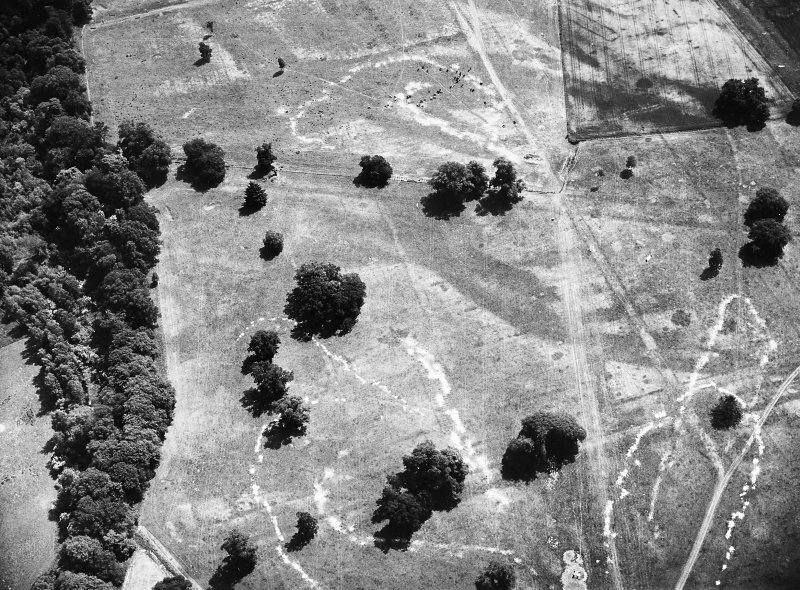 Nor were other camp entrance features, such as tituli, revealed. 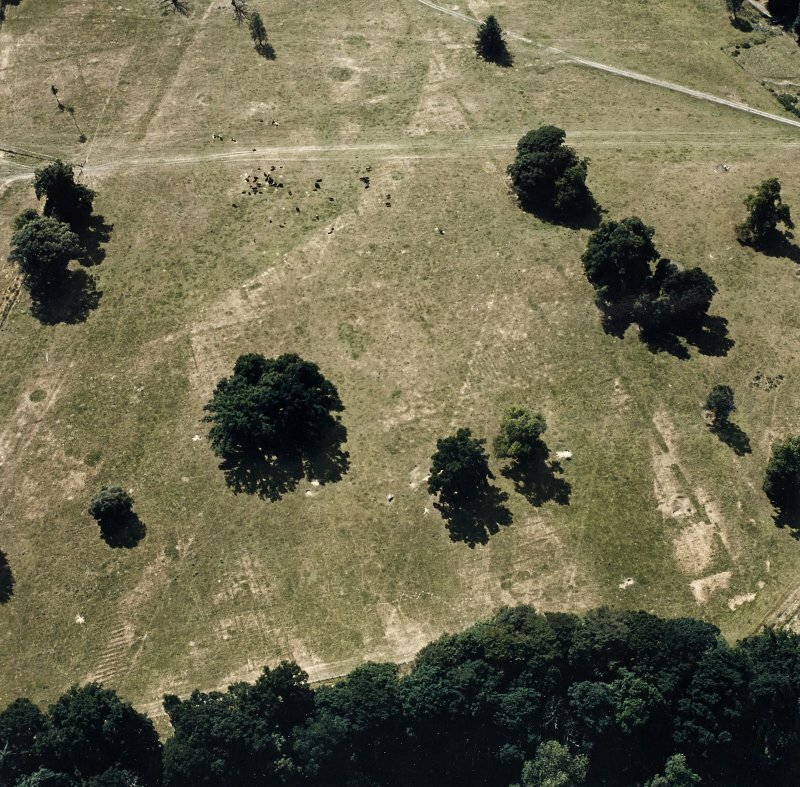 Moreover, the enclosure appeared to be entirely open to the E, with no sign of either an E ditch, or a turn at the eastern end of the S ditch to form a corner. 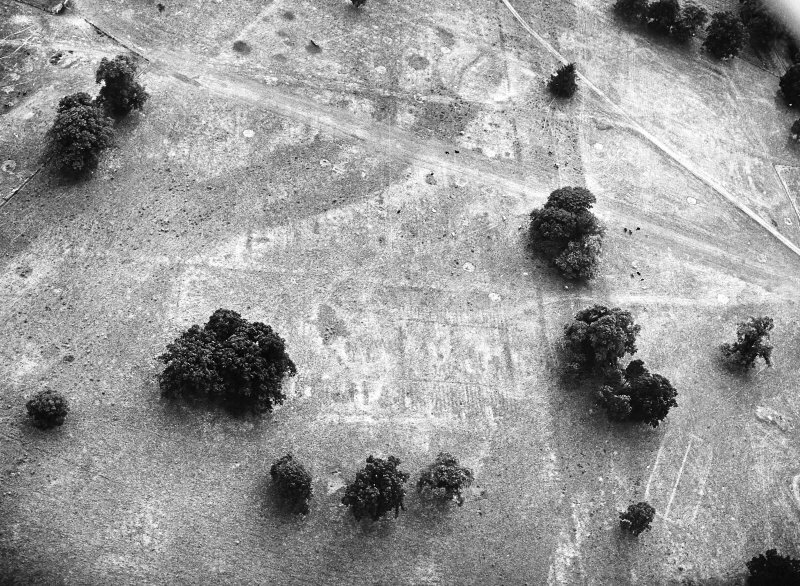 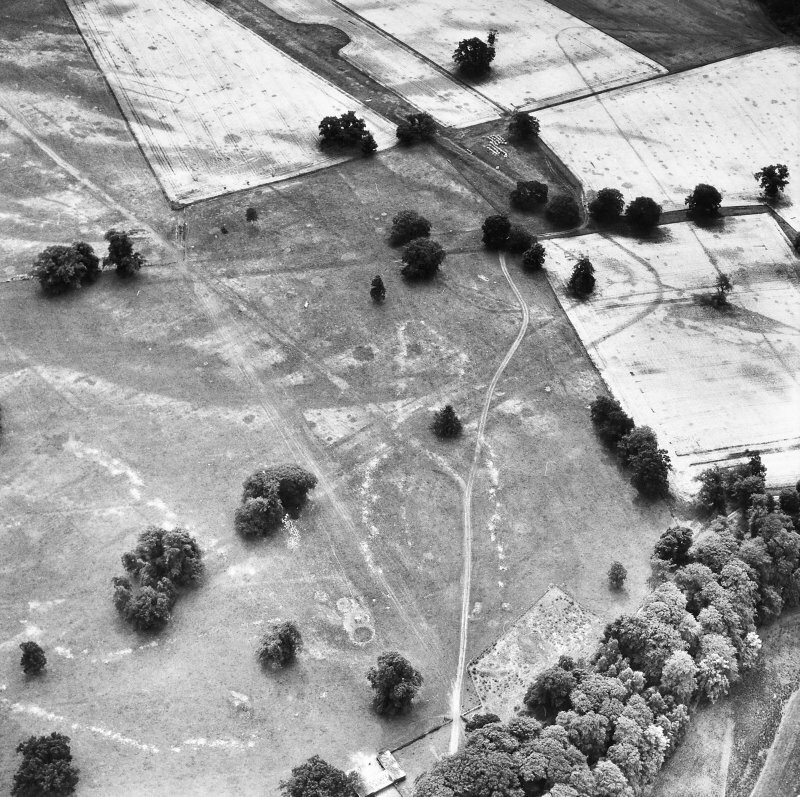 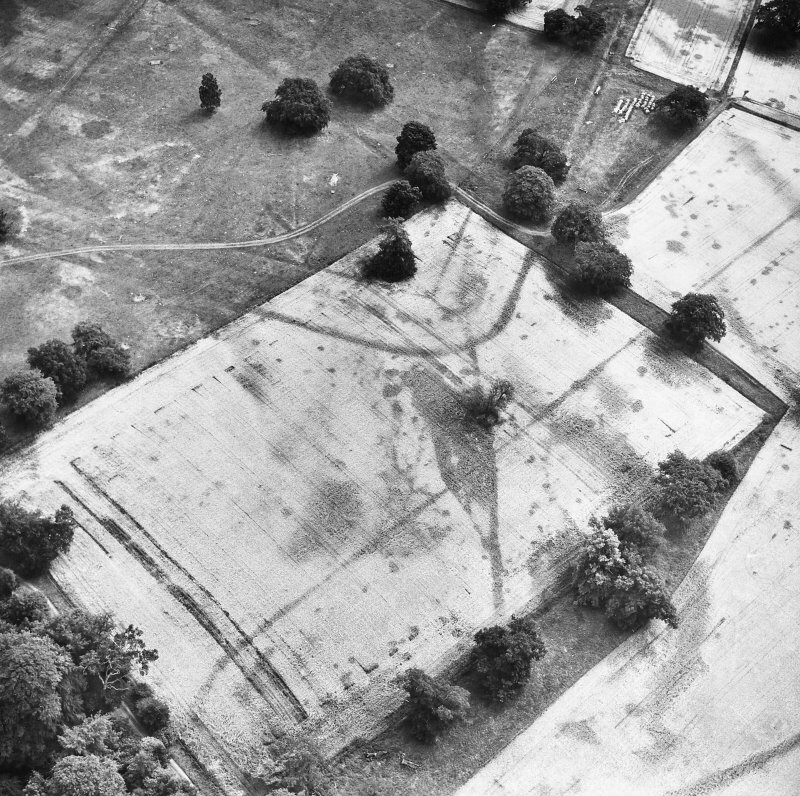 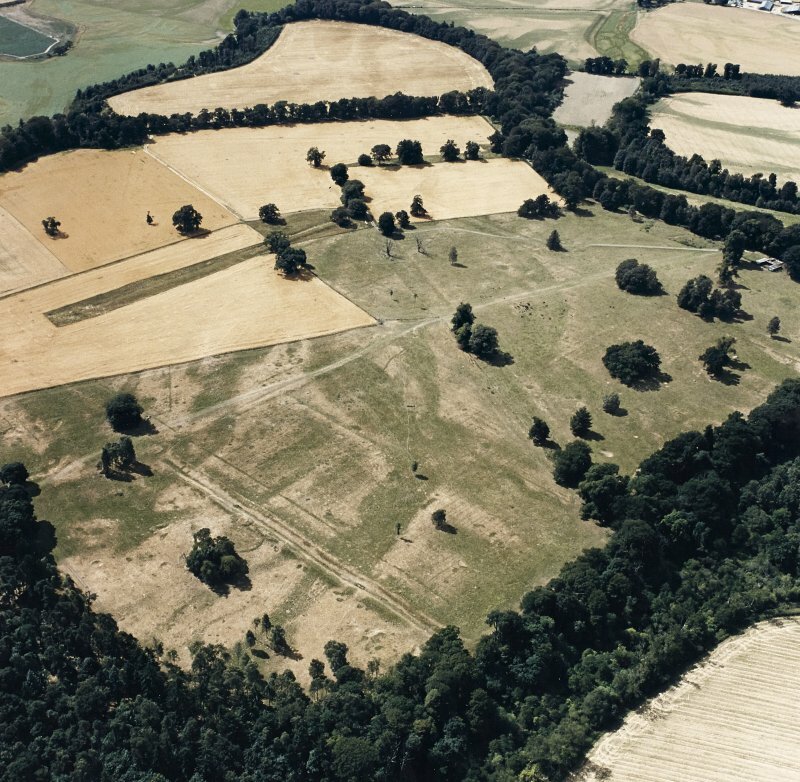 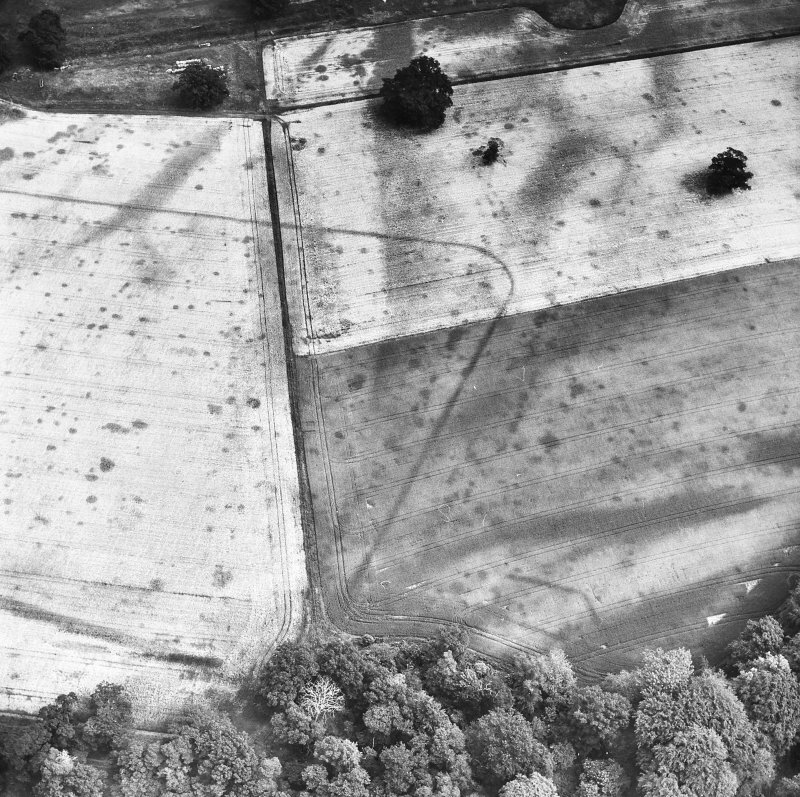 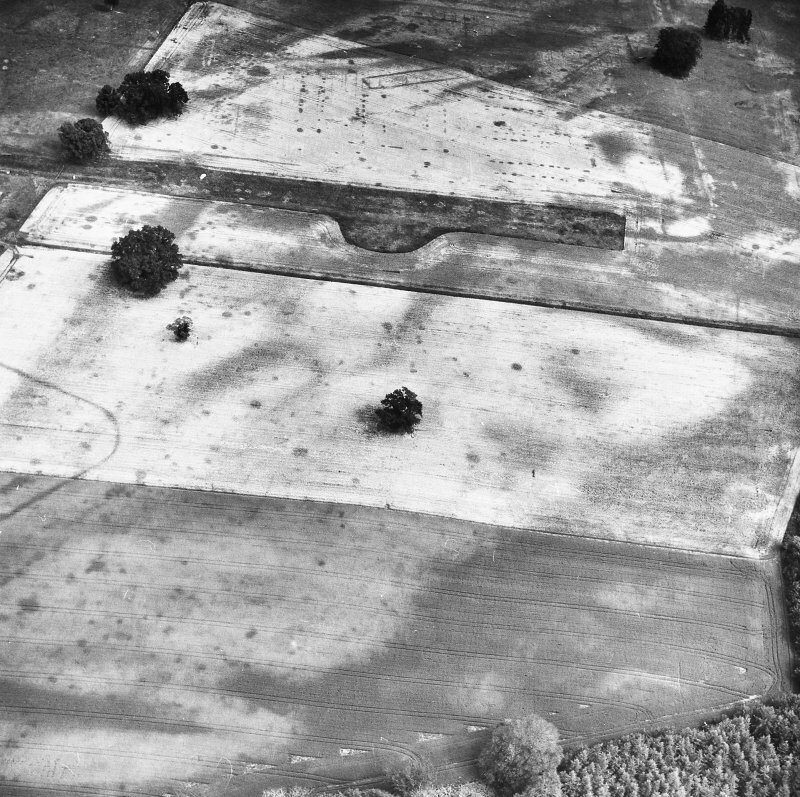 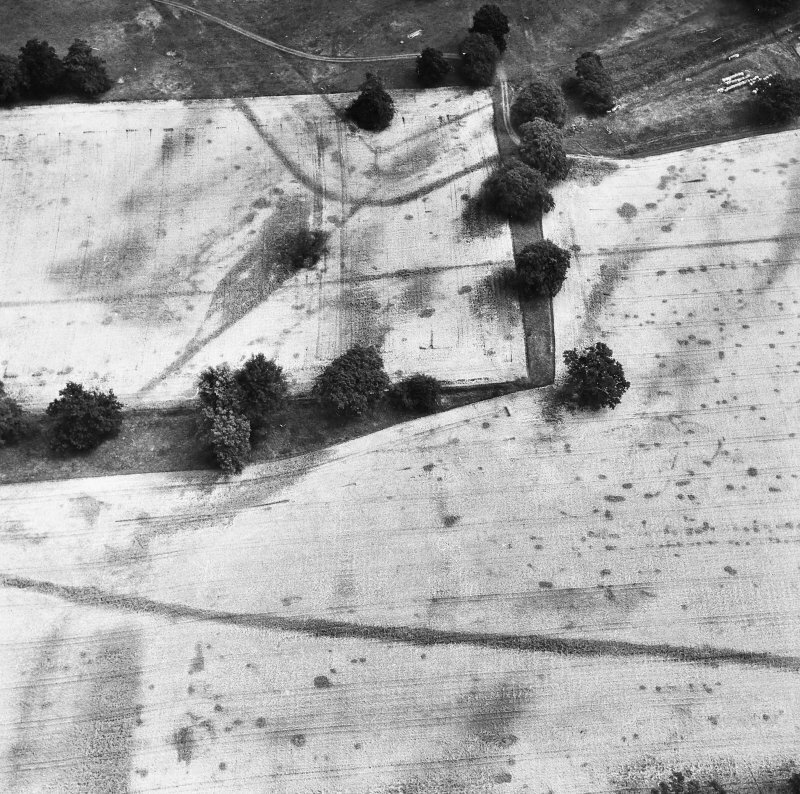 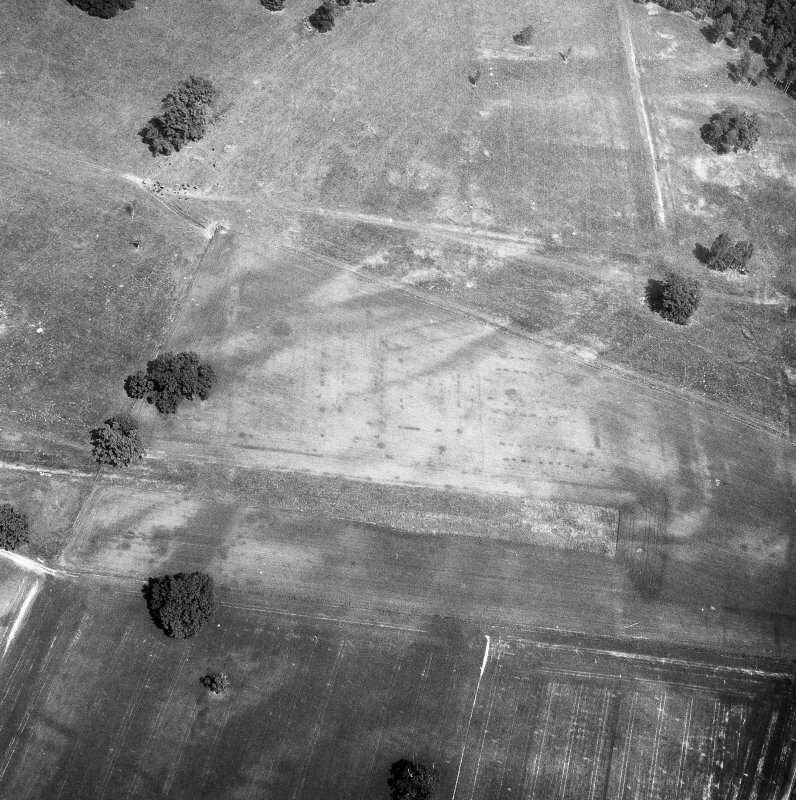 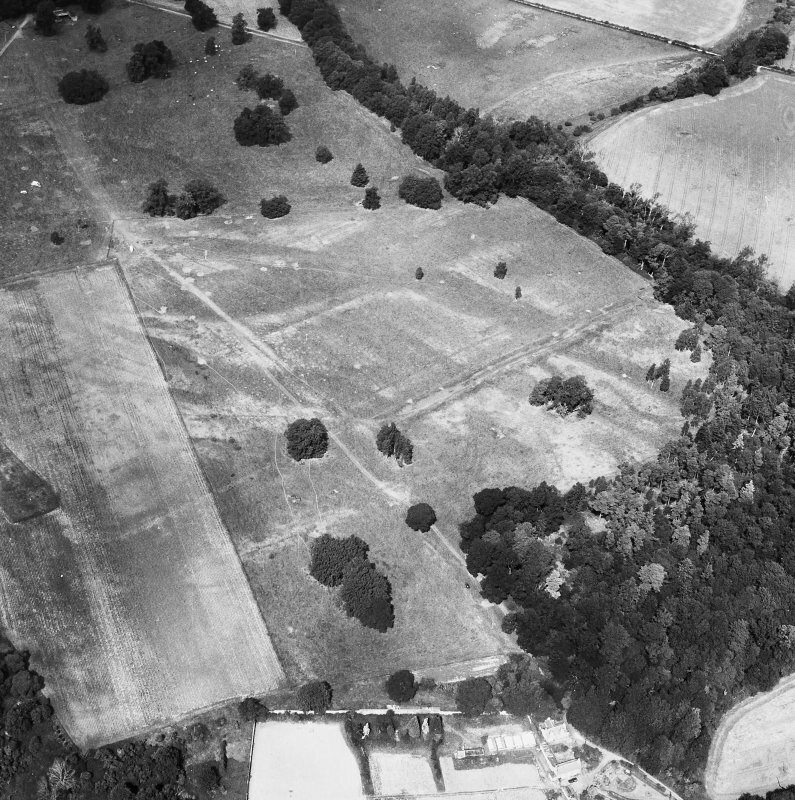 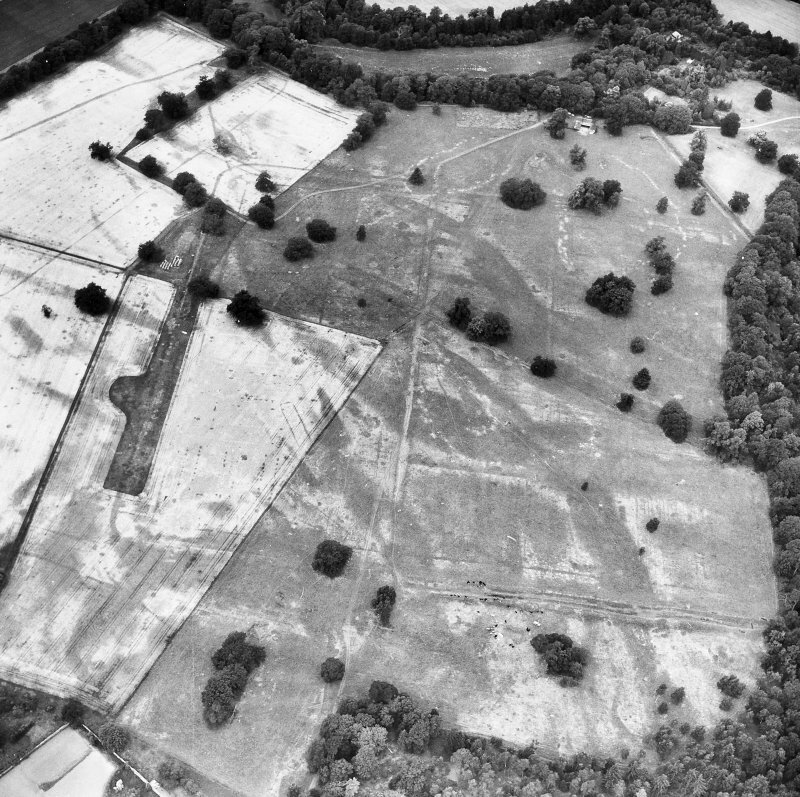 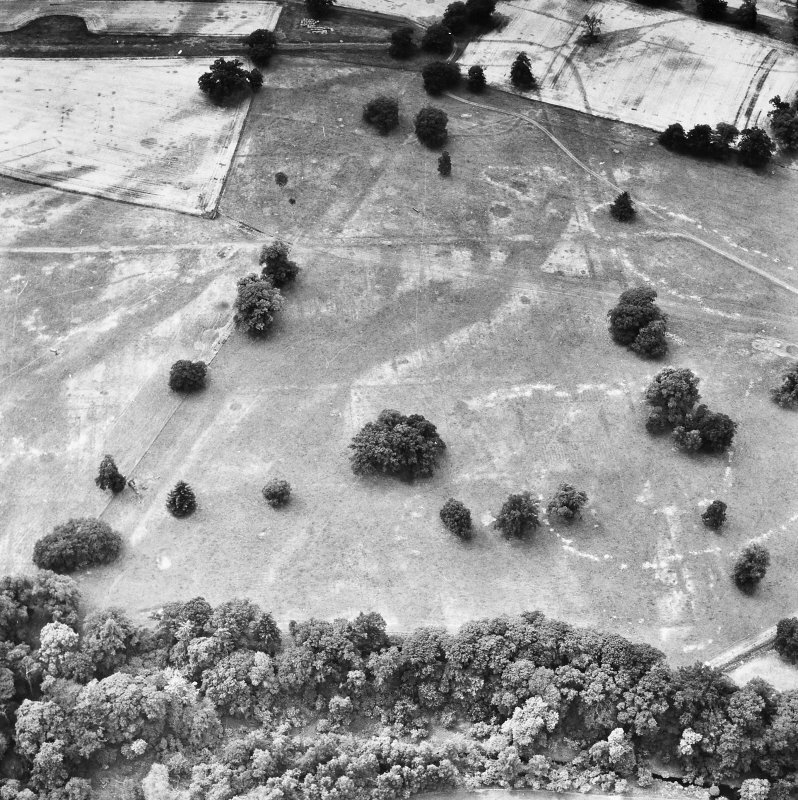 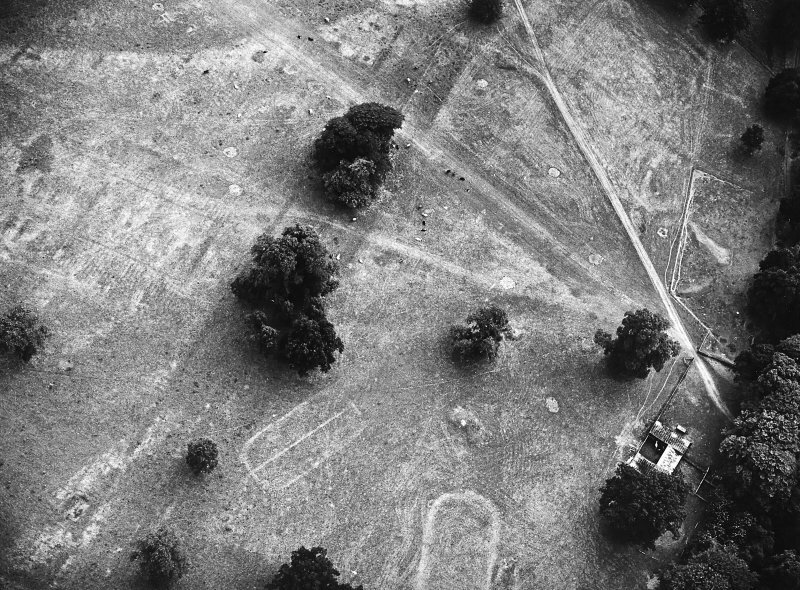 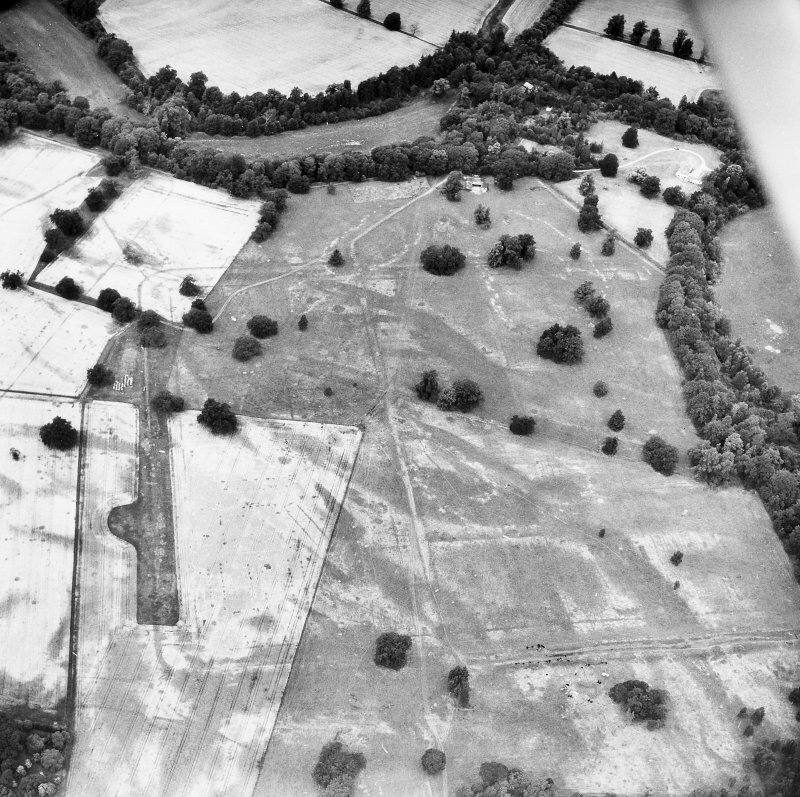 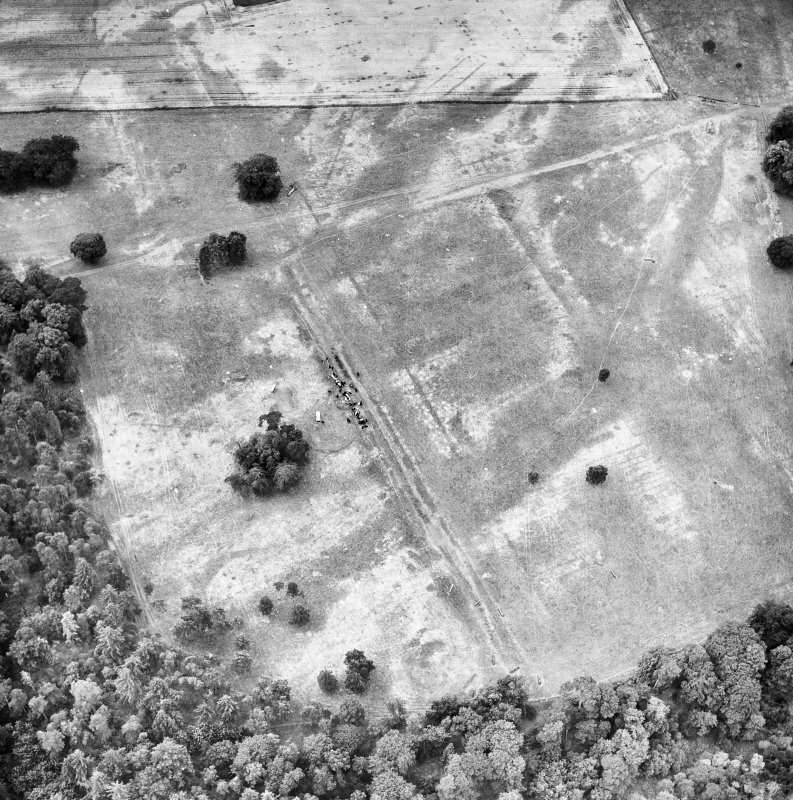 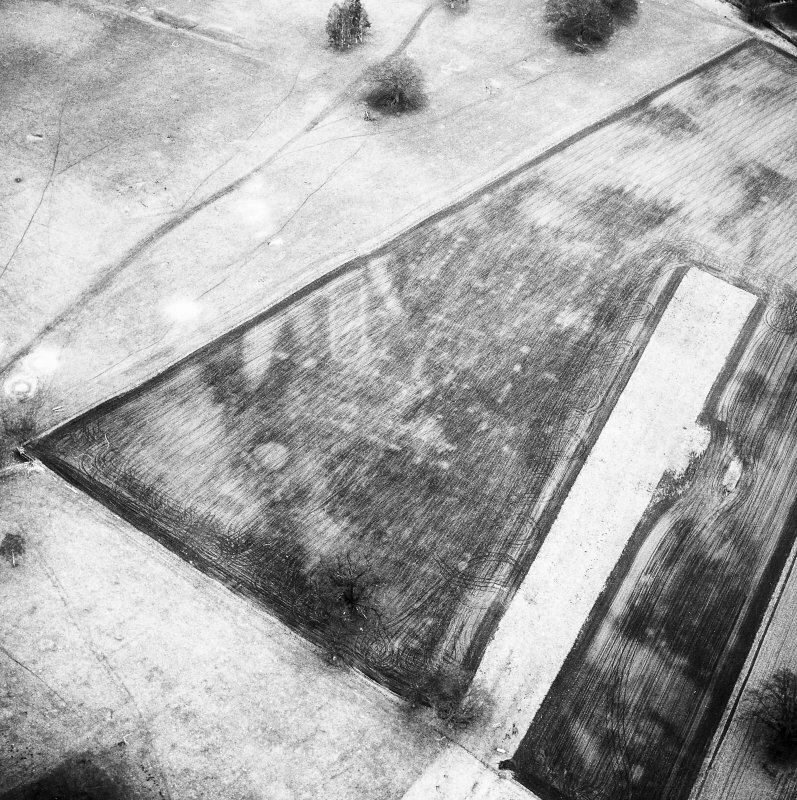 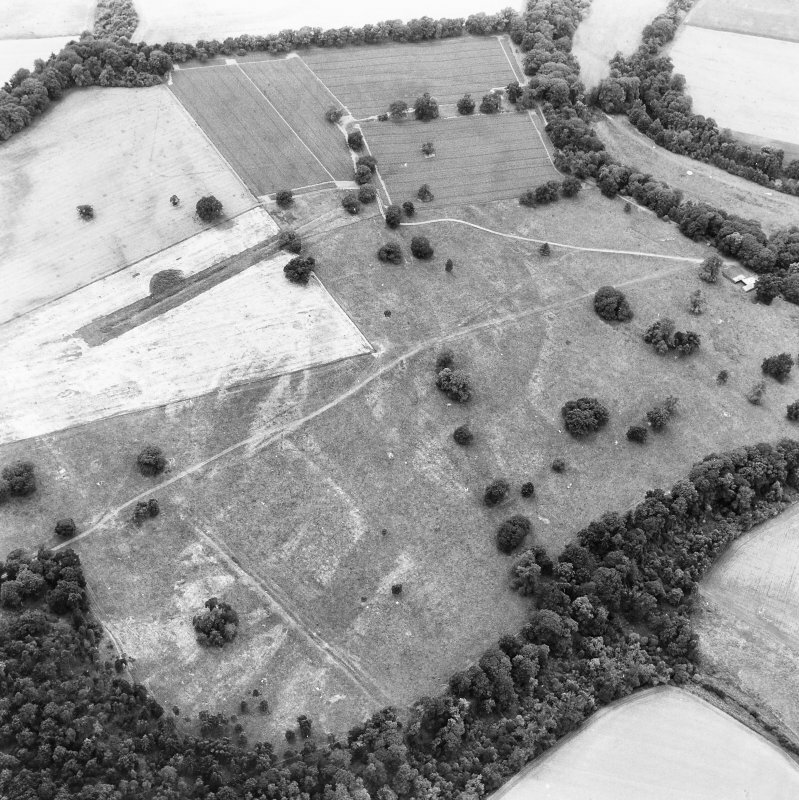 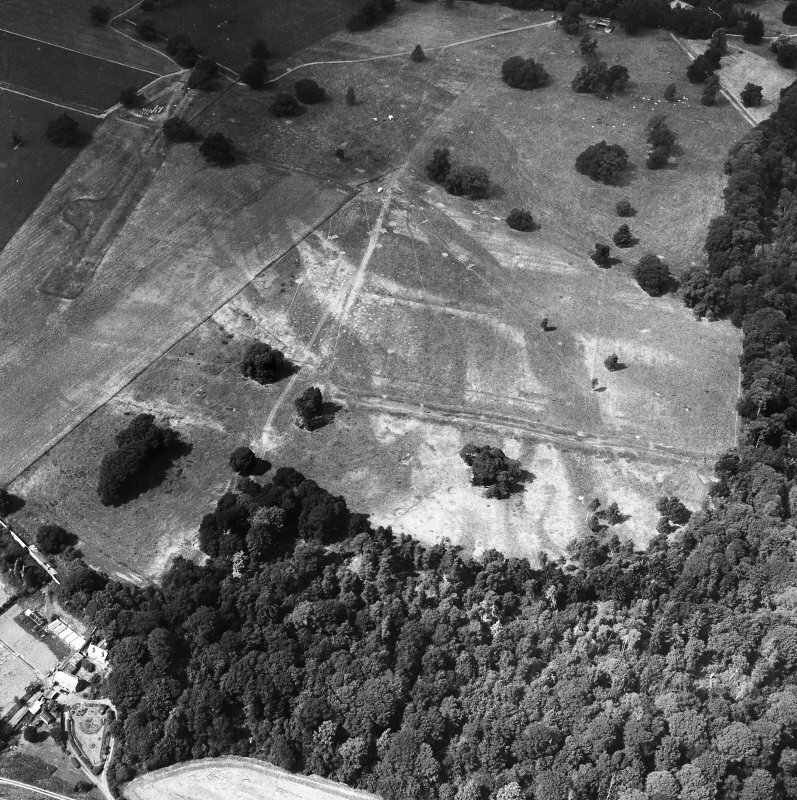 The site shows poorly from the air (unlike the large camp), but what data has been obtained bears out the impression gained from the survey image. 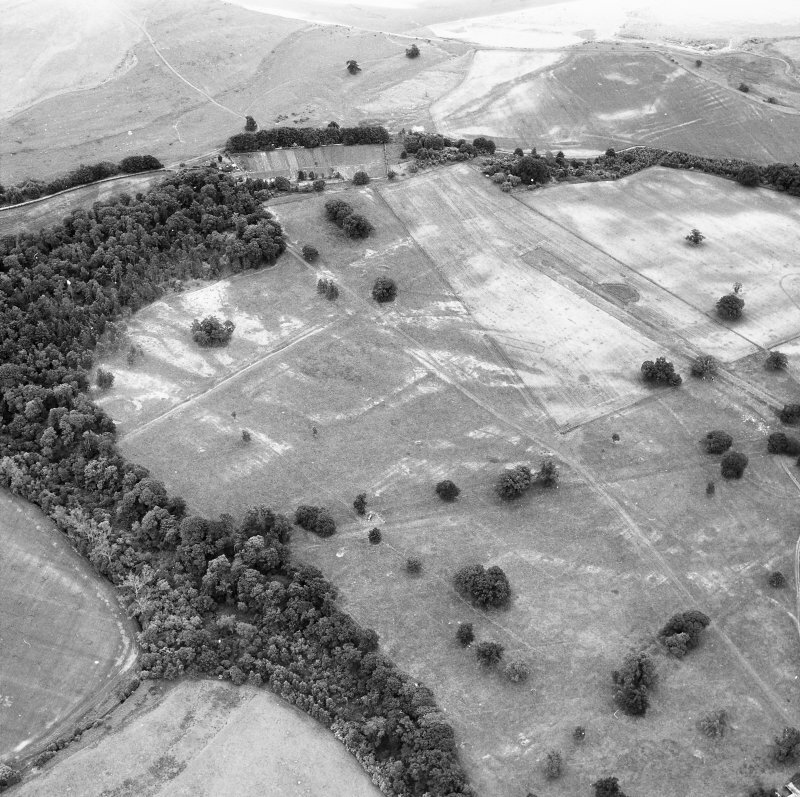 A resistance survey is planned, to make a further search for the E ditch but, on present evidence, there must now be some doubt as to whether this is a Roman camp. 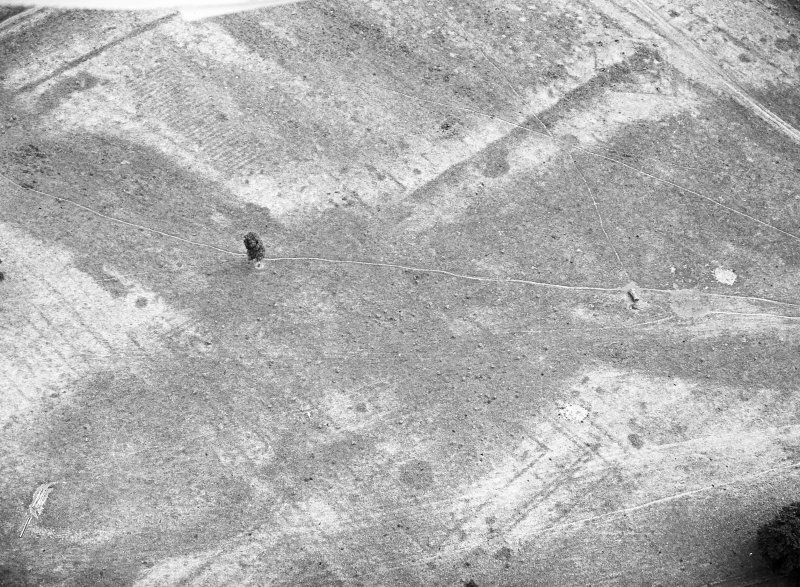 NO 125 397 The geophysical survey begun in 2009 (DES 2009, 145) of the fortress and its surroundings, continued. 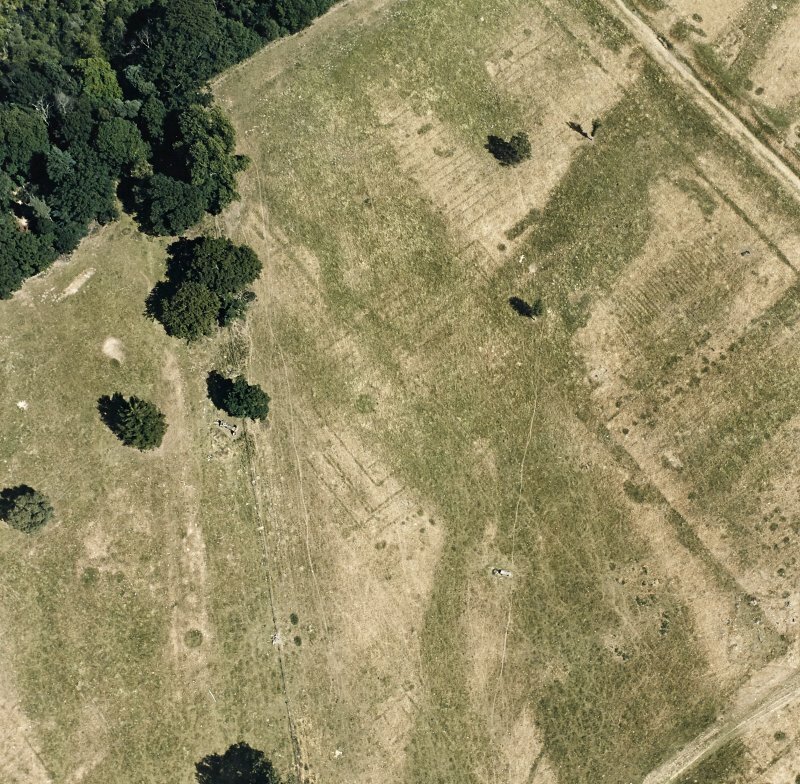 It had been intended that the work would concentrate on the area of the temporary camps to the SW of the main fortress area, but the late harvest caused by an unusually poor summer delayed things considerably. 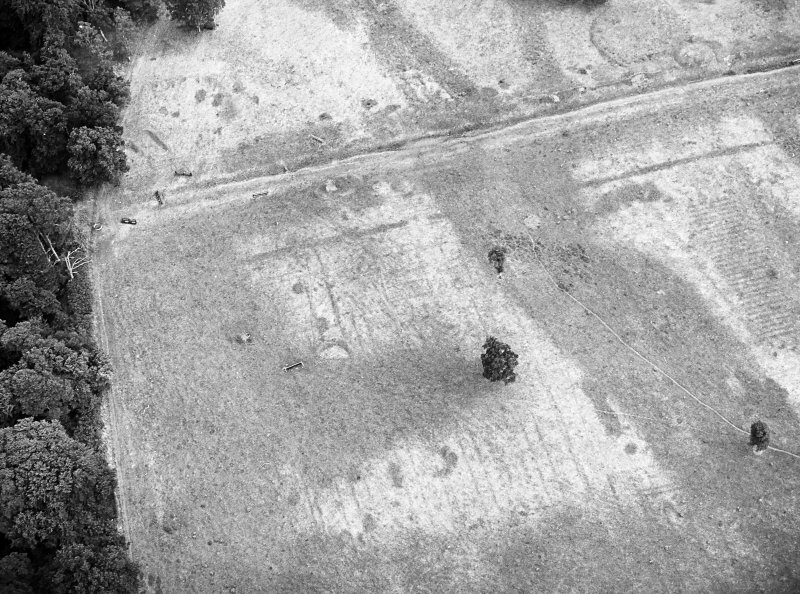 Instead, large scale resistance work was continued inside the fortress, and some of the principal internal buildings which had already been covered magnetically, were re-scanned at higher resolution (0.5 x 0.125m). 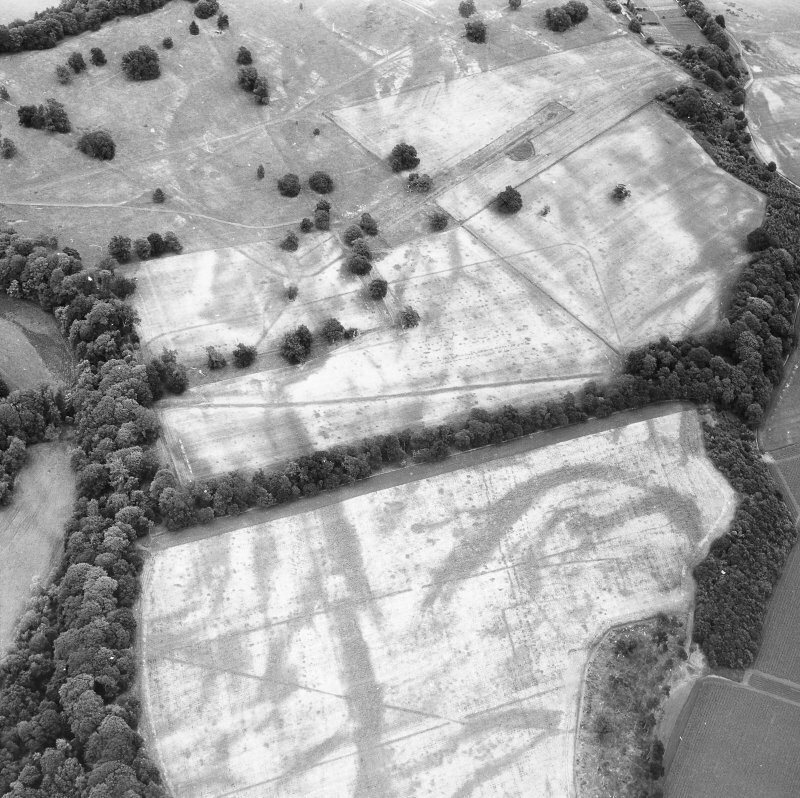 This produced superb detail, in places showing features that had not been detected by the Richmond excavations. 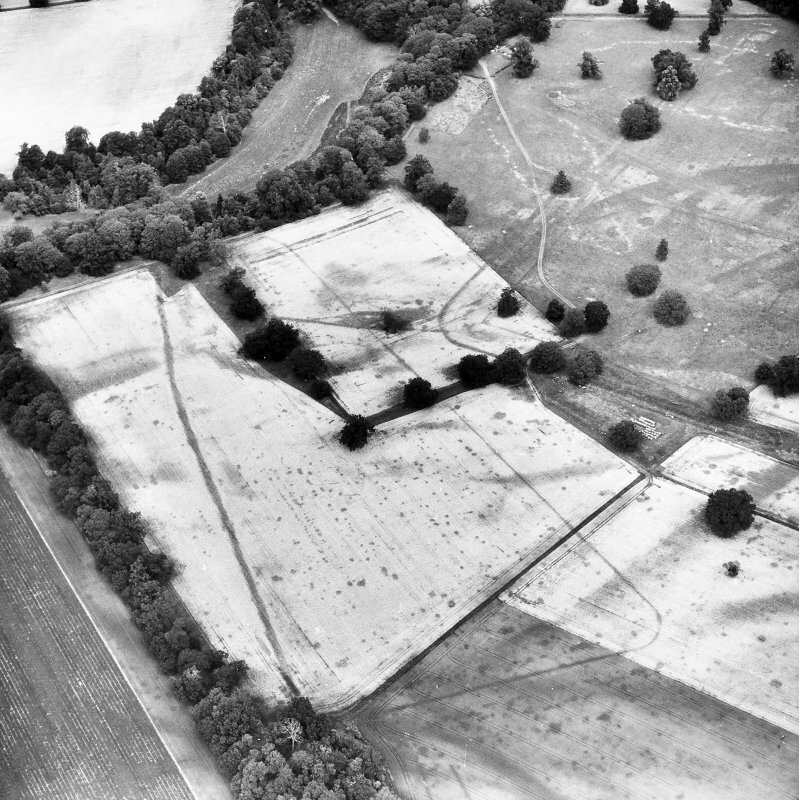 The best image was produced by the hospital building, and its surrounding barracks, where individual posts could be seen, but the principia and fabrica also produced excellent data (for example a passage between rooms in the NE wing of the latter). 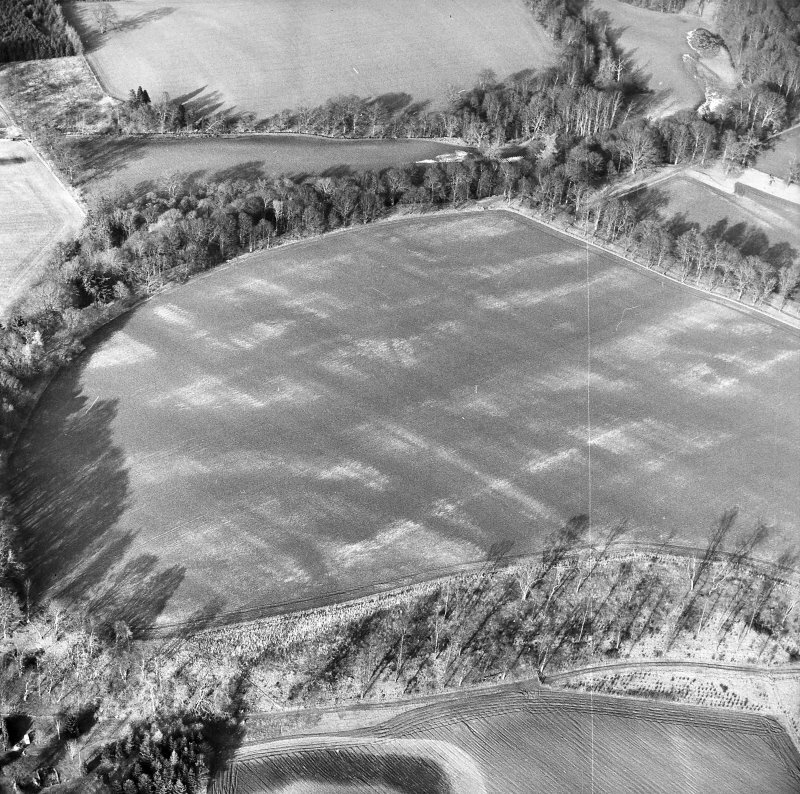 Outside the fortress, a large oval feature detected near the NE gate in 2009 had caused speculation that it might represent an amphitheatre. 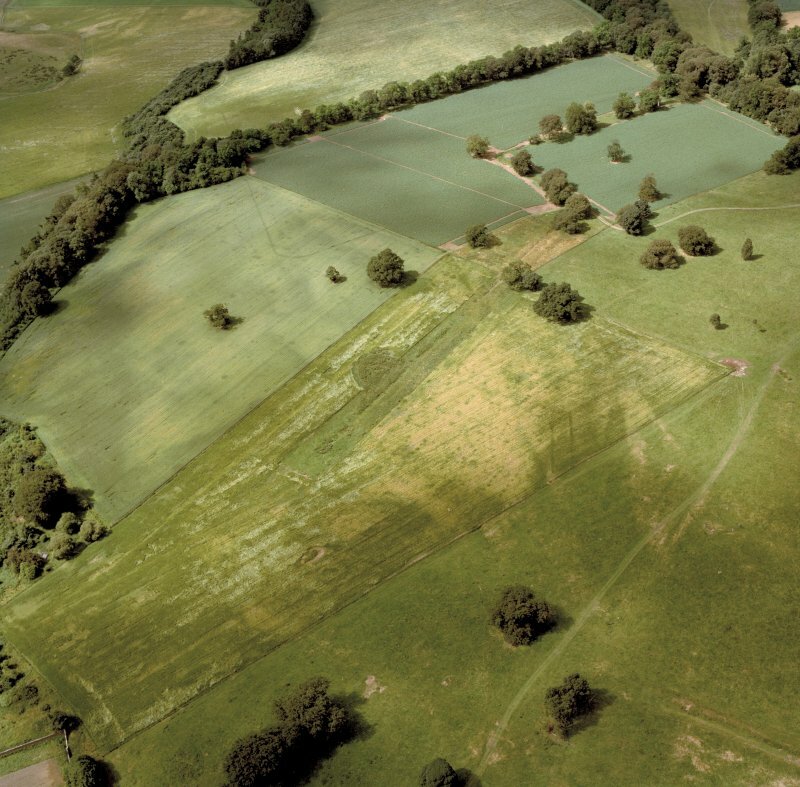 The higher resolution data refuted this, however, by showing the feature to be caused by two different features that had previously appeared conflated. 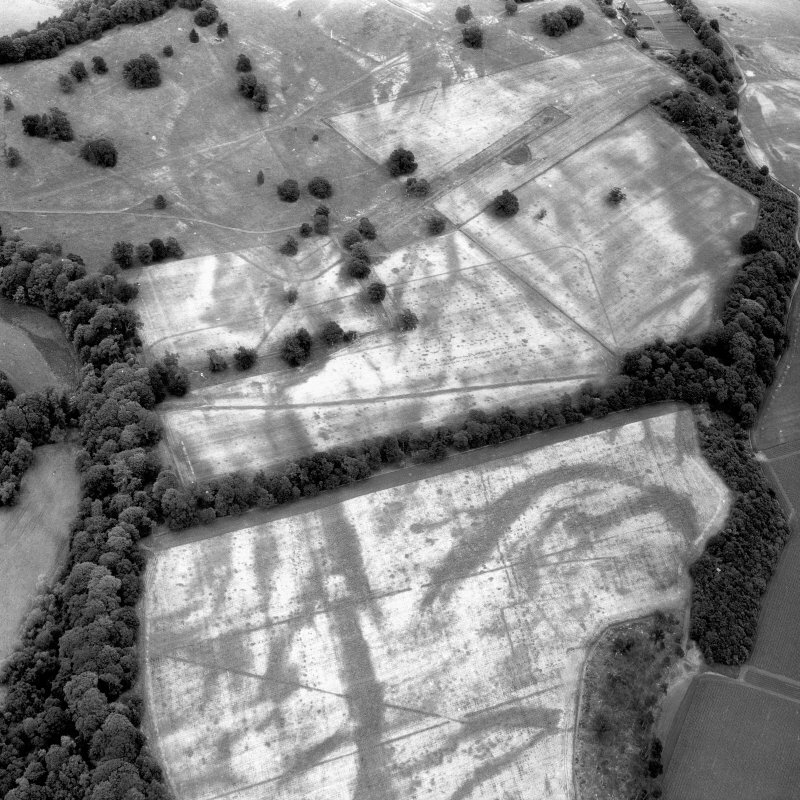 Some work was also possible in the arable fields further W. Magnetic work in 2010 (DES 2010, 137) had cast doubt on the identification of a rectangular enclosure, towards the SW end of the plateau, as a small Roman temporary camp because only three sides could be detected and no entrance breaks were found in the remaining sides. 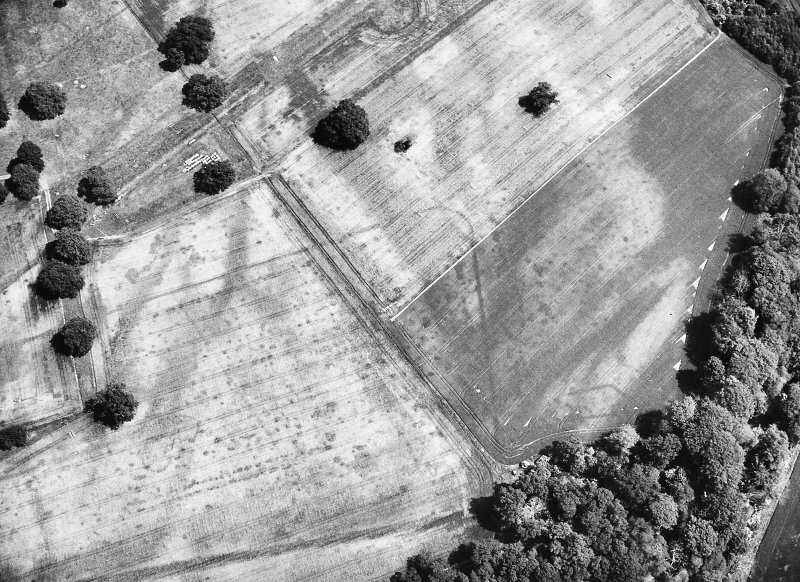 Aerial coverage had produced the same picture, and in 2011 so did a resistance survey. 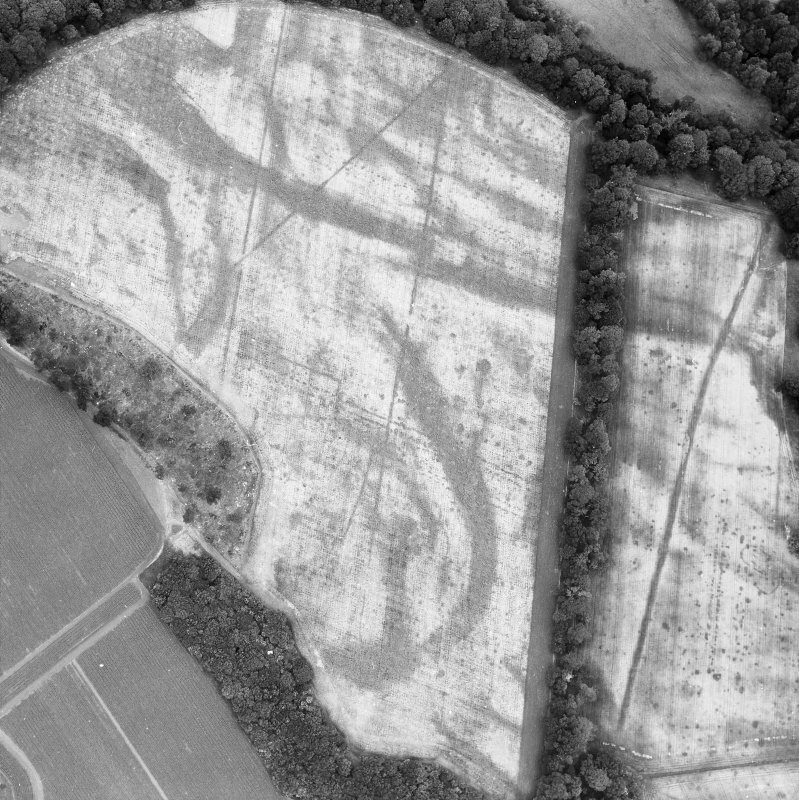 As resistance can often locate ditches missed by other remote sensing techniques, this seems to be a further indication that the feature is unlikely to be a completed Roman camp. 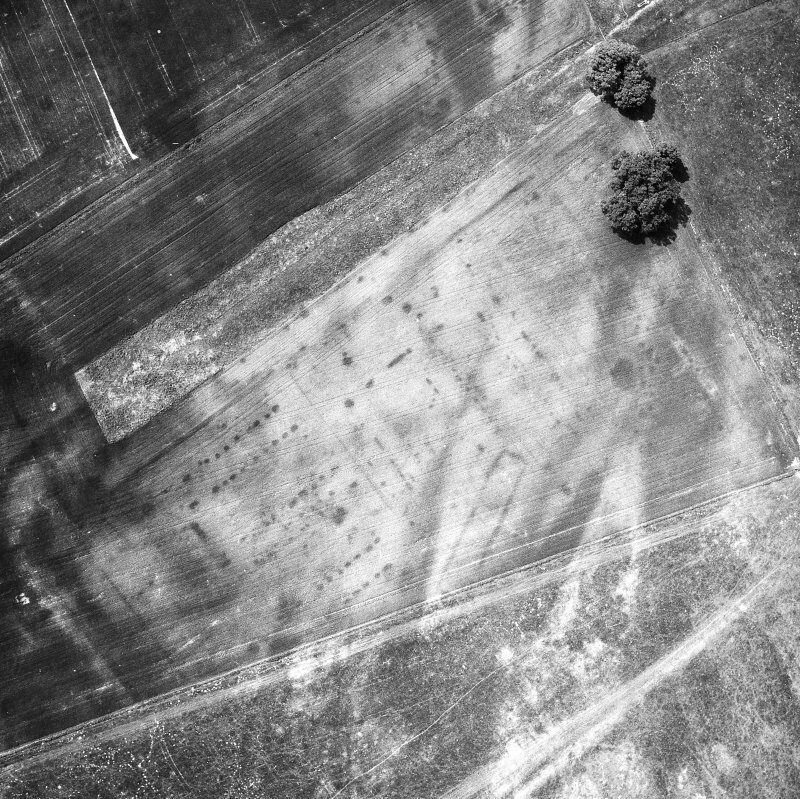 Continued survey of the large temporary camp, nearer the fortress, confirmed the indications gained in past seasons of an even denser pattern of internal (and indeed external) pits than that seen in air photographs. 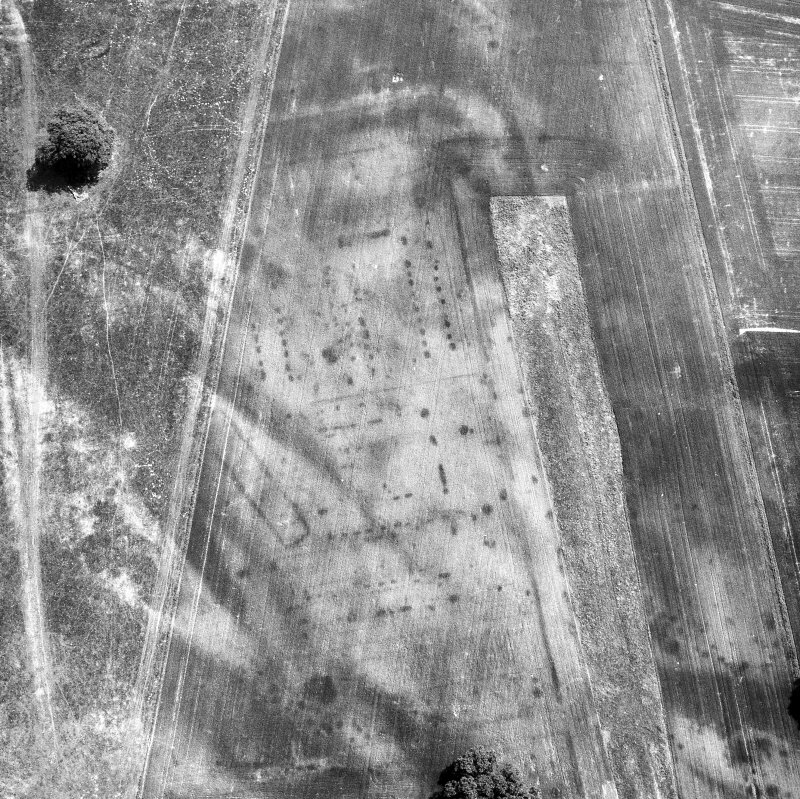 Finally, coverage of the so called 'officers' compound' further E revealed what is likely to be a third barrack to the S of the two already known from excavation.